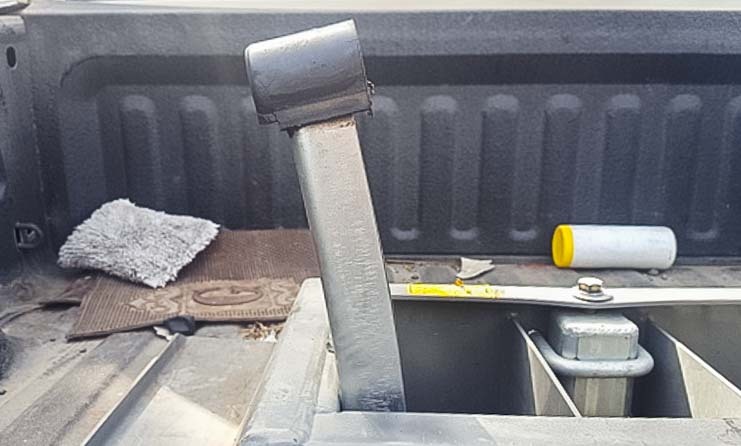 How do you put DEF fluid in a truck without spilling a drop? 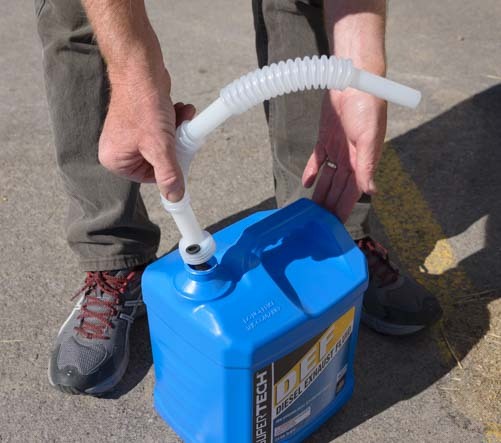 Here are a few tips for diesel truck owners out there as well as lots of helpful info about Diesel Exhaust Fluid, what it does and where we found it’s cheapest to buy. 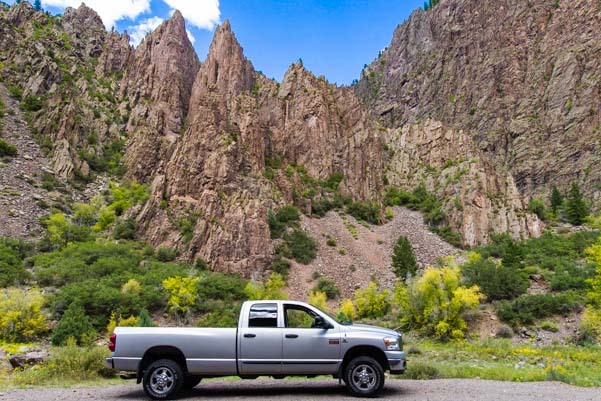 Since 2010, diesel pickup truck engines have relied on Selective Catalytic Reduction technology (SCR), which uses Diesel Exhaust Fluid (DEF), to meet the EPA emmissions standards. 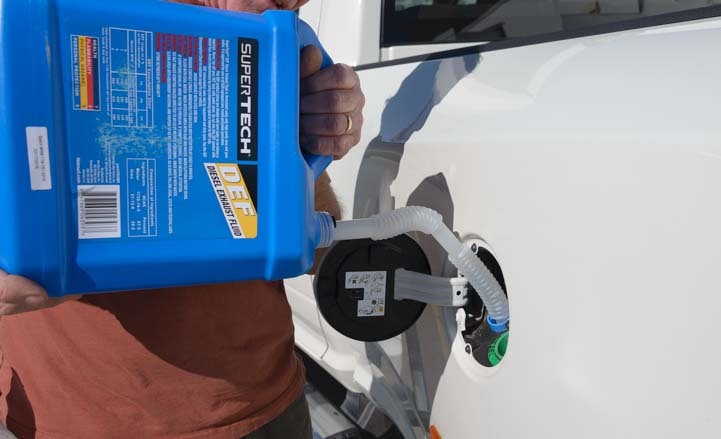 DEF is a mixture of 1/3 urea and 2/3 de-ionized water, and it is sprayed into the exhaust system of diesel trucks to reduce the nitrous oxide (NOx) emissions into harmless nitrogen and water. 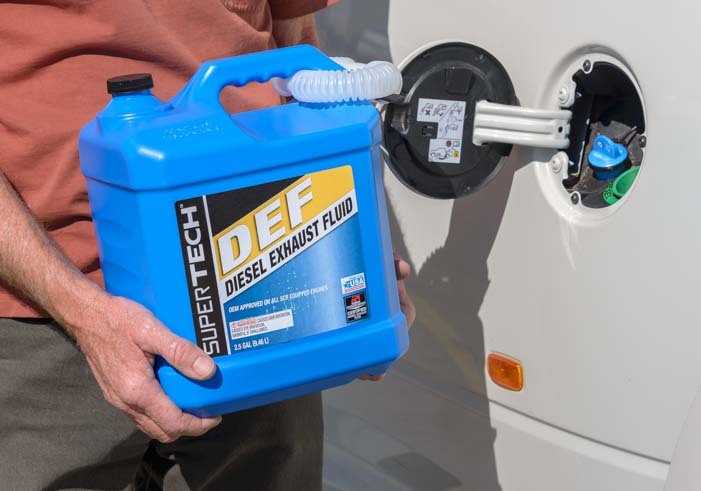 Late model diesel trucks require refilling the DEF tank! 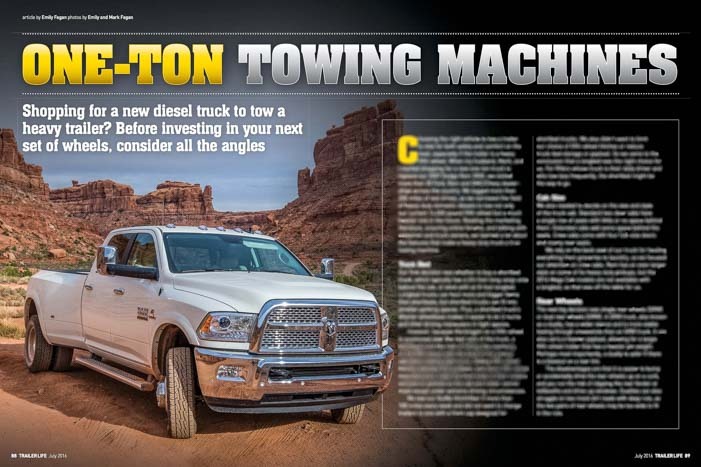 Each manufacturer designs their trucks with a tank to hold the DEF, and you have to replenish it every so often. 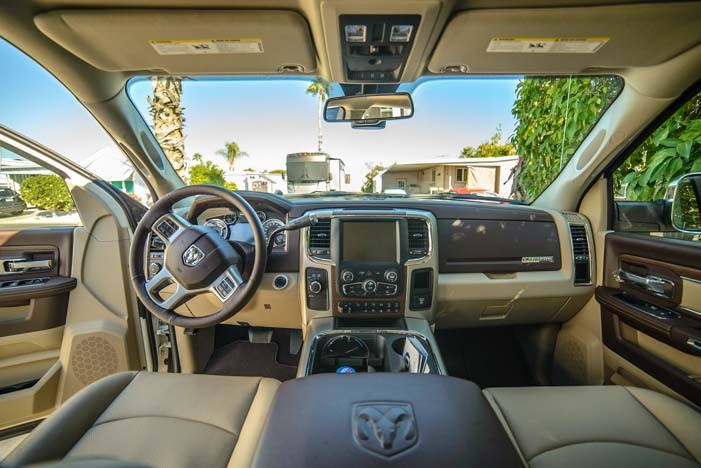 Our 2016 Dodge Ram 3500 has a 5 gallon DEF tank. 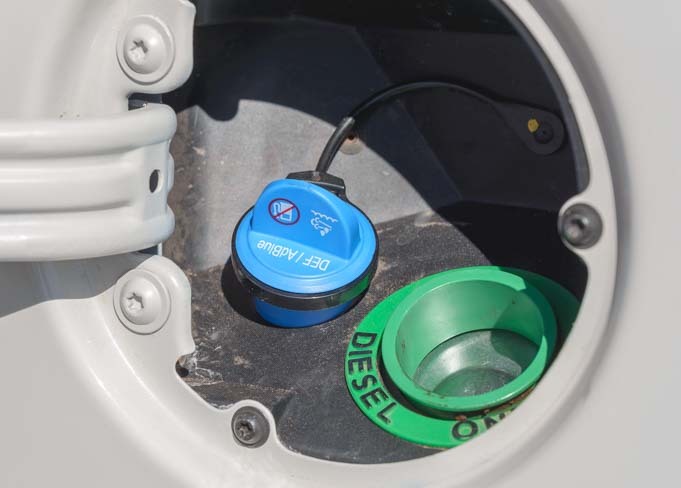 The filler hole is under the gas cap next to the diesel filler hole. 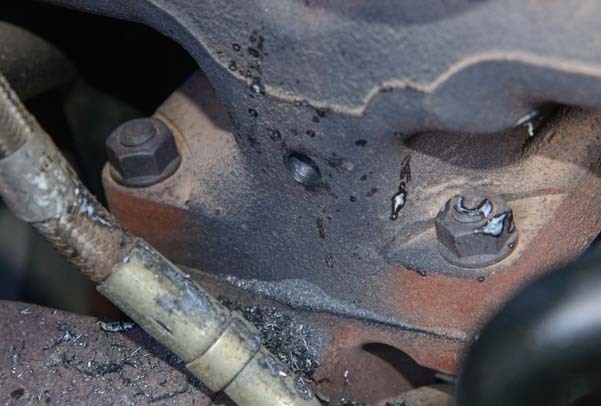 On some brands of trucks the filler hole is in the engine compartment under the hood. 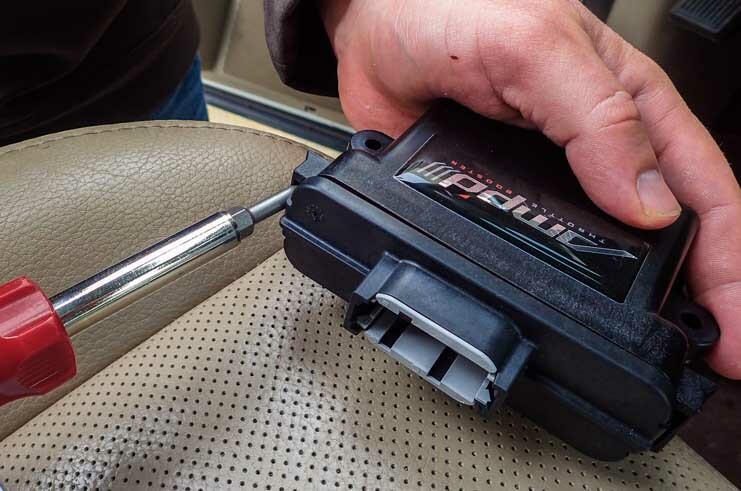 We use this handy magnetic gas cap. 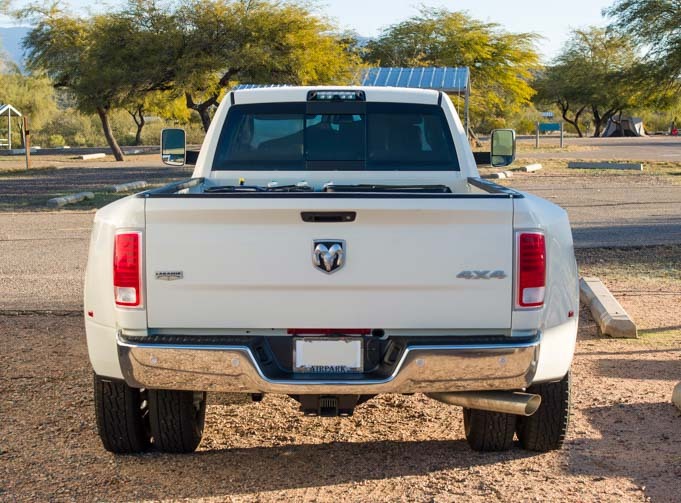 As a side note, opening the gas cap on a Ram truck is interesting because there is no screw-on dust cap covering the diesel filler hole inside. 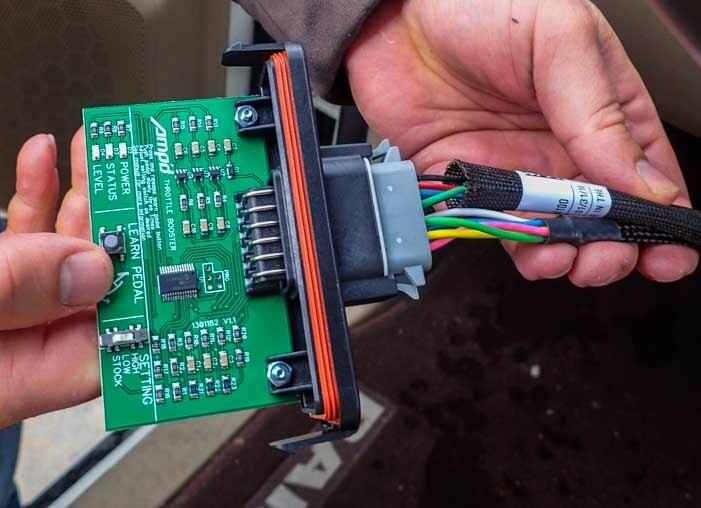 There’s just a spring-loaded flap. 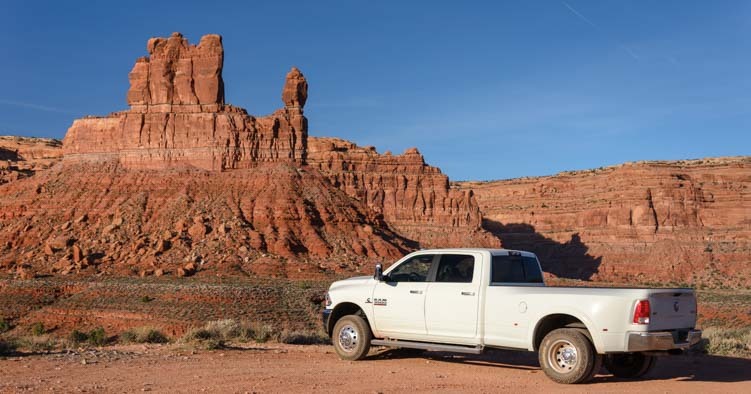 We find we need to wipe down the whole area after we’ve taken the truck out on four wheel drive roads in dusty places like southeastern Utah. 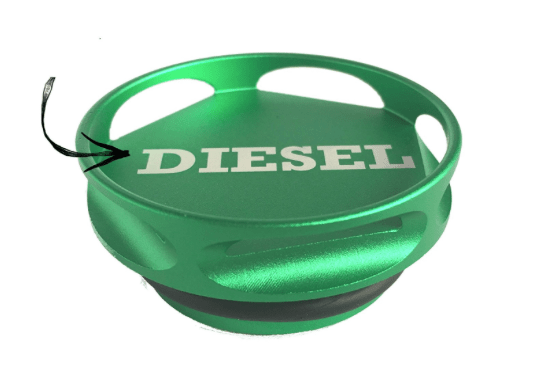 We use a nifty aftermarket diesel gas cap that uses a magnet to keep it handy during fill-ups. 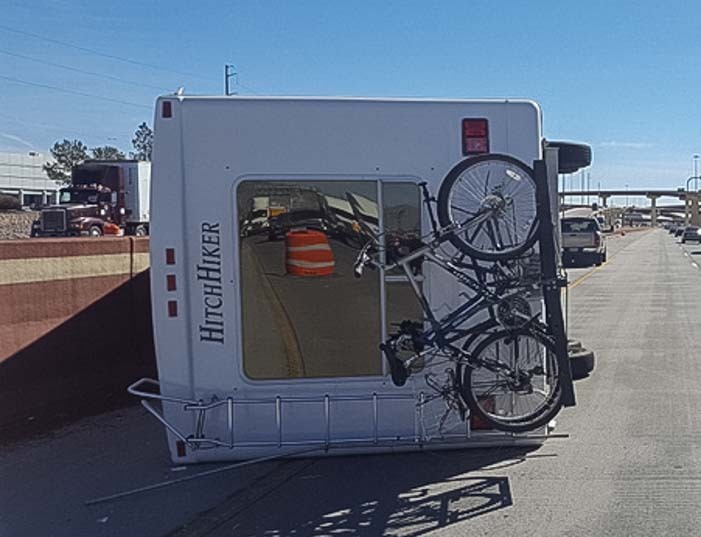 Just stick it on the side of the truck. Very cool! A slightly less expensive one is also available here. 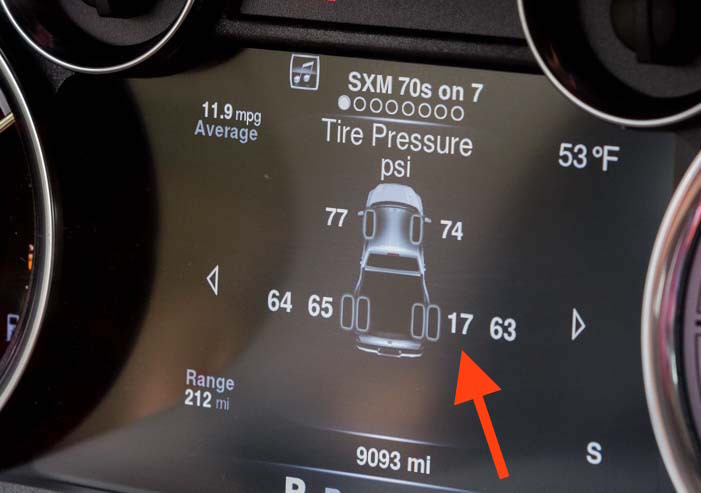 While it would seem trivial to refill the DEF tank, we struggled the first few times with the bulky jugs and awkward spouts, and it dripped here and there and was basically a pain in the neck. We’ve also shopped around quite a bit to find DEF that is fairly inexpensive. One of the more common brands is BlueDEF. Others are Command DEF by Prestone and Blue Blood by Cam2. You can also buy it in bulk (see below). 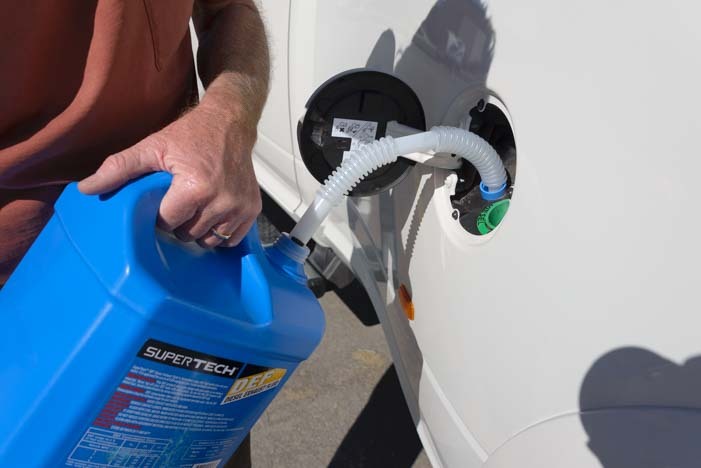 However, the best deal we’ve found is the big blue 2.5 gallon jug of SuperTech DEF sold at Walmart (in-store) for $7.88. 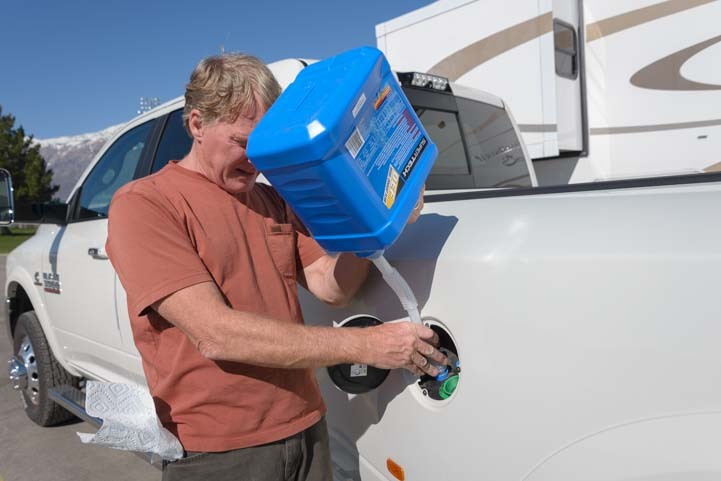 The jug is easy to use and it’s drip-free. SuperTech DEF comes with a flexible pouring spout that is wrapped around the handle. 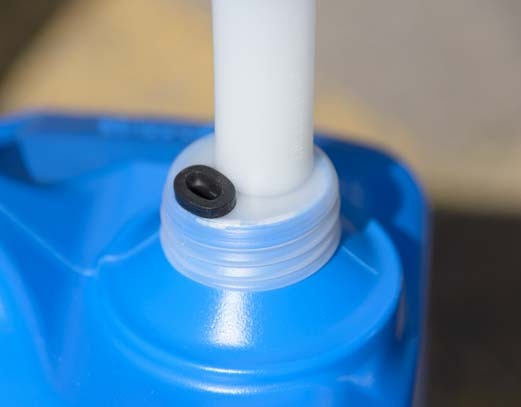 Simply unscrew the jug’s cap and screw the spout on until it’s really tight. 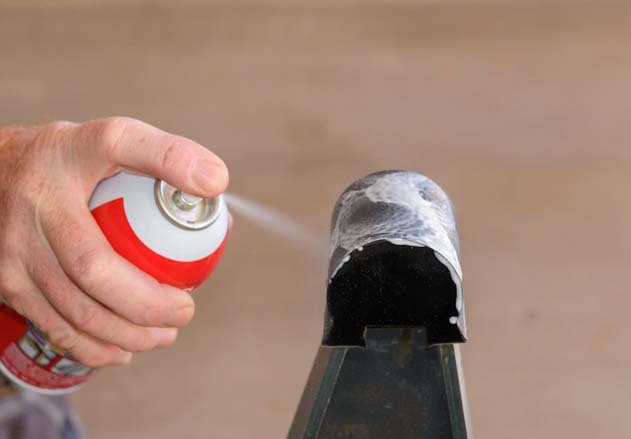 There is a small black vent hole on the spout, and this little guy is essential to making the whole process go smoothly and cleanly. 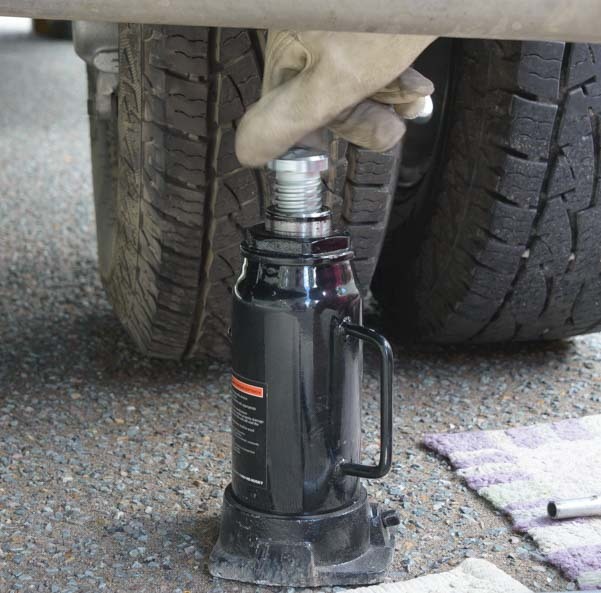 After putting the flexible spout securely into the filler hole on the truck, give the jug a small squeeze to start the flow of fluid. 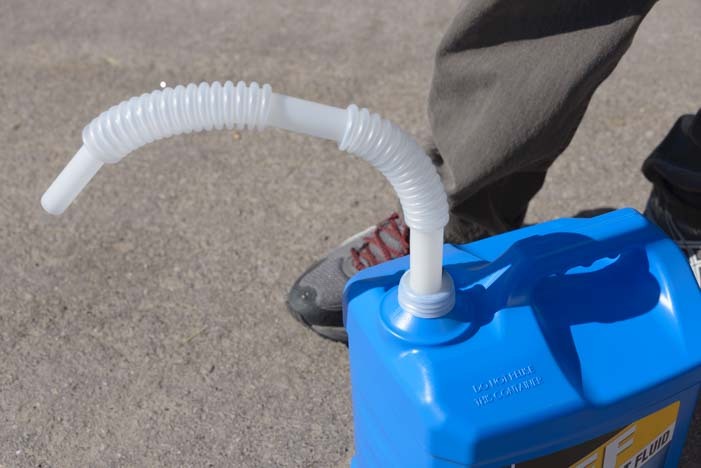 This will make the vent hole on the jug such air in, which vents the jug and allows the fluid to flow easily. Once the spout is inserted securely in the filler hole, squeeze the bottle slightly to start the flow. 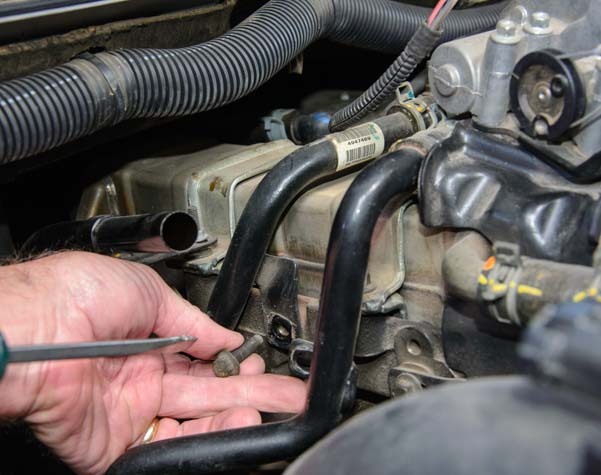 Make sure all the fluid has been poured into the tank, and then you’re done! Empty the contents into the DEF tank. 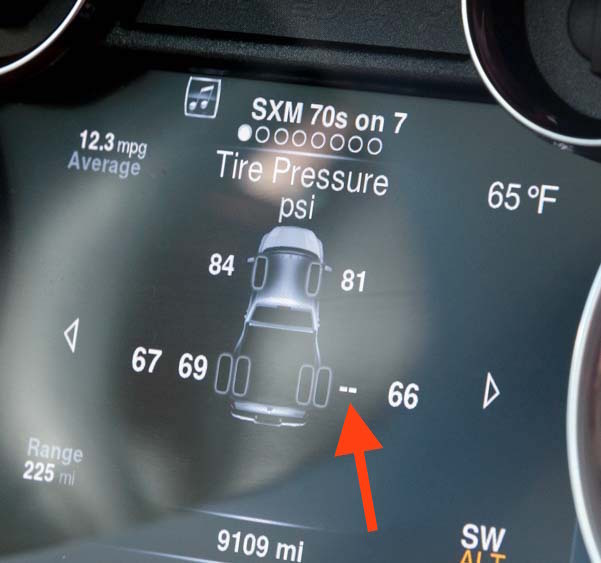 The first time we did this, we didn’t squeeze the jug first, and DEF dribbled out the air vent. But if you get the siphon going properly, by squeezing the jug as you start to pour, it’s a cinch. 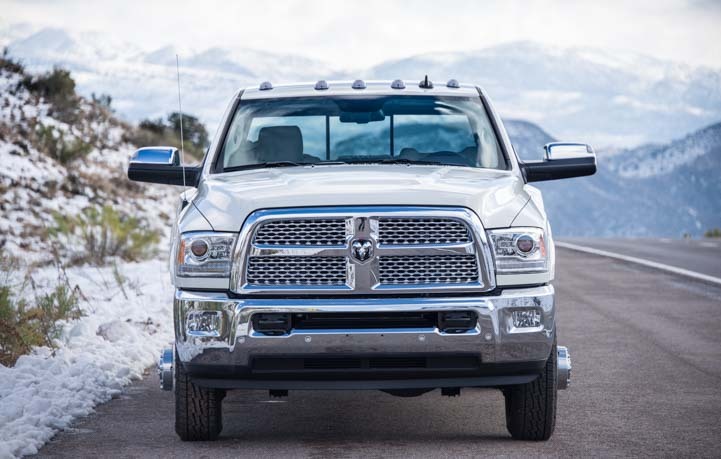 Our Ram truck has a dashboard gauge that indicates the fill level of the DEF tank. When it gets down to half full, we put a 2.5 gallon jug of DEF into the tank to fill it back up again. 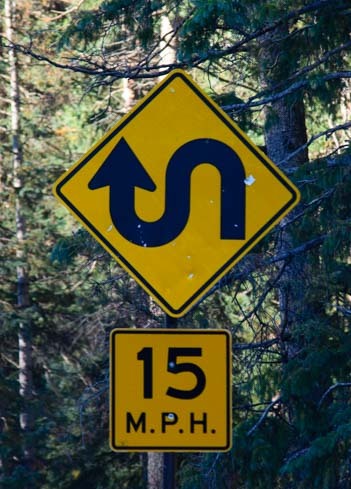 We typically do this every 1,000 miles or so. DEF has a minimum shelf life of a year. We keep just one 2.5 gallon jug on hand at all times. Since we refill our tank about every four to six weeks, we never remotely approach its shelf life. 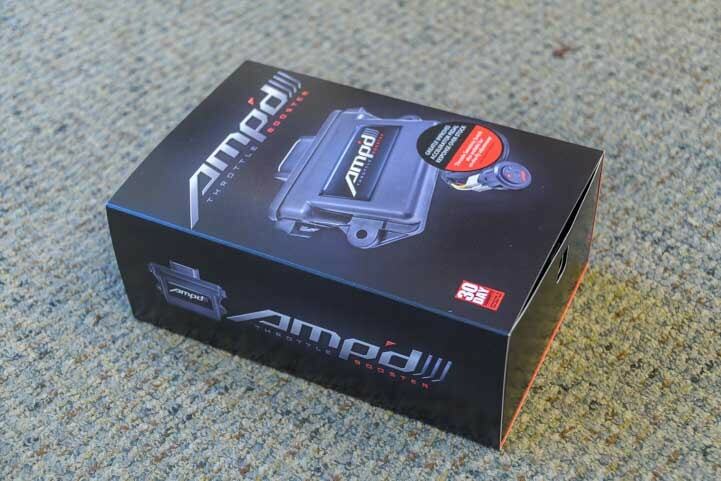 Another option for DEF fluid is to get it in bulk at a gas station. This is not common yet, and most gas stations don’t have DEF in bulk. 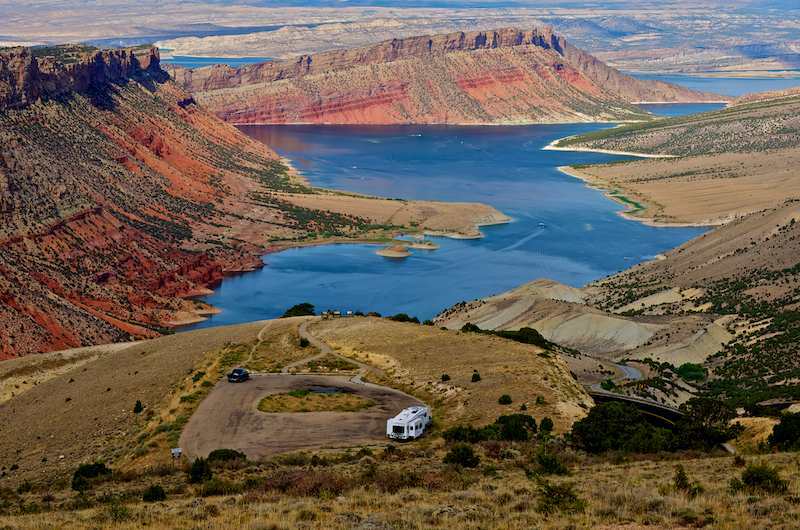 However, Flying J and Pilot truck stops carry it at some of their travel centers (see links at the end for locations). 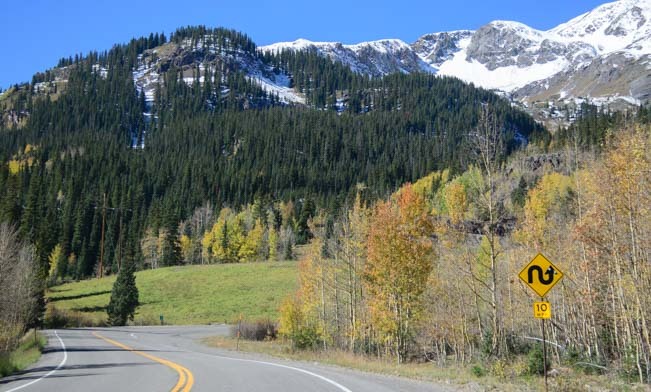 In our travels, we don’t often fill up at Flying J or Pilot, simply because they tend to be on the interstates and we tend to be on back country roads. So, we haven’t yet seen or been able to take advantage of their bulk DEF at the pump. 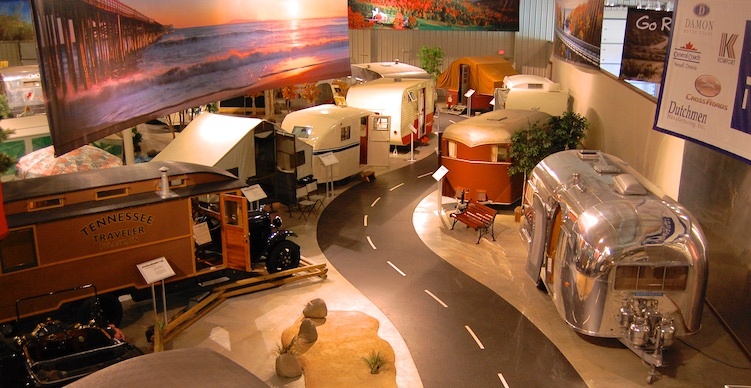 However, for RVers that use these travel centers a lot, this is a super way to go. The current bulk Flying J / Pilot DEF price at many of their centers is a little less than the SuperTech bottled price (~$2.79/gallon vs. $3.16/gallon). 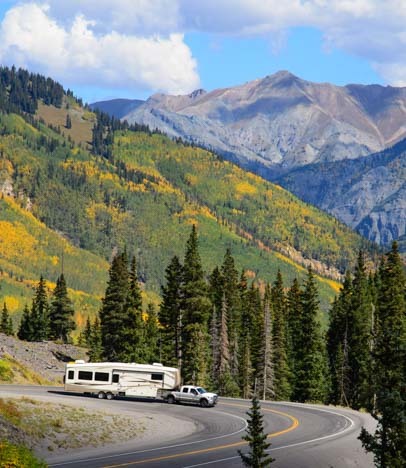 Pilot / Flying J offers a discount card for RV travelers that gives a few cents off on fuel and 50% off on RV dump station fees, and special discounts for Good Sam Club members. 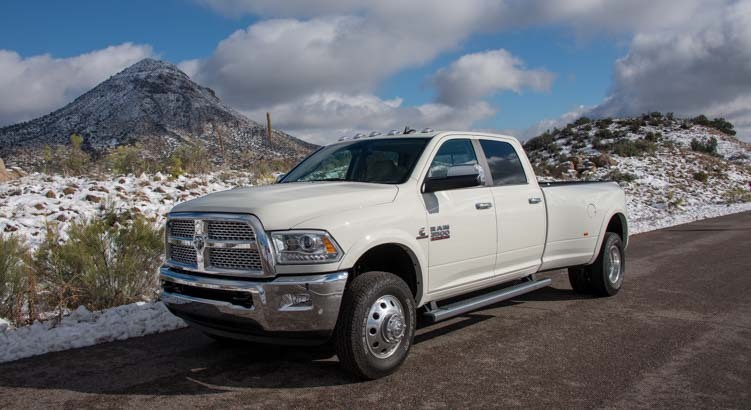 What are the pros and cons with a truck that uses DEF fluid? 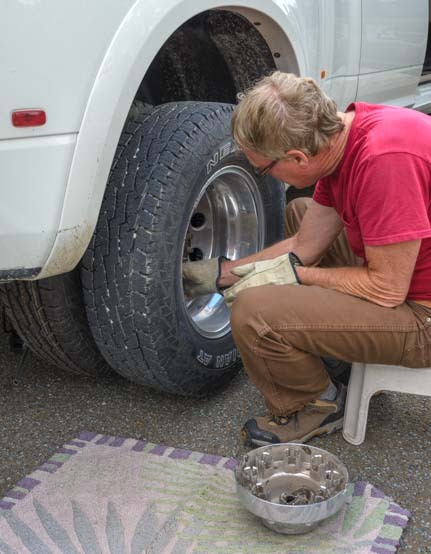 An obvious disadvantage is that you’ve got to do this extra little chore every so often. However, there are benefits too. 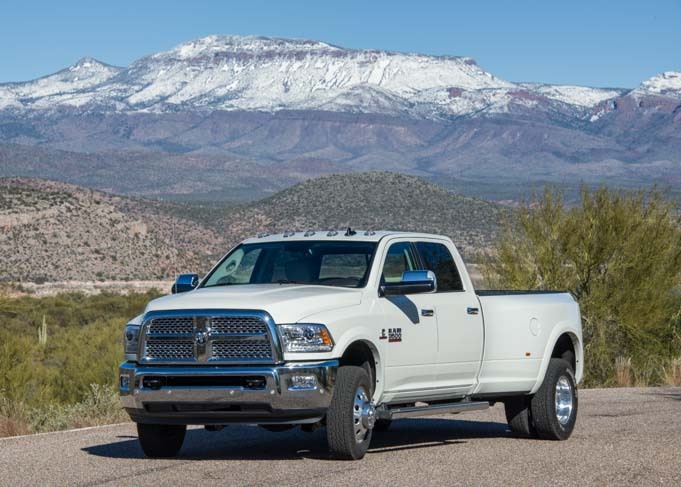 The fuel mileage is slightly better on SCR equipped engines than on older trucks that used a Diesel Particulate Filter (DPF) to meet the EPA emissions standards (like our 2007 Dodge Ram 3500). 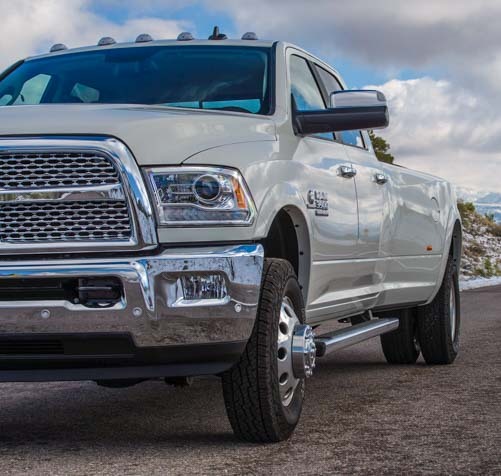 Cummins, manufacturer of the engine in the Dodge Ram line of diesel trucks, says the improvement can be up to 5%. This increase in fuel economy is because the improved conversion of NOx emissions allows the newer engines to be fully optimized. 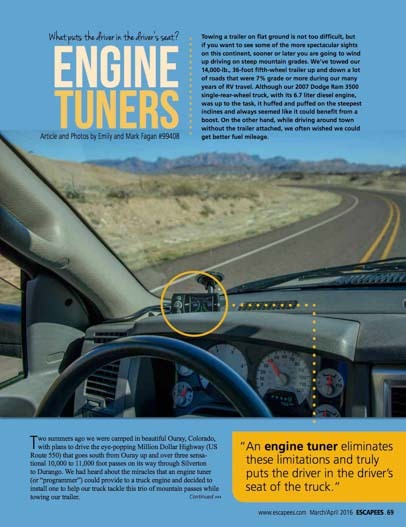 Also, the older engines go into a “Regen” frequently to burn off the particulates in the Diesel Particulate Filter. 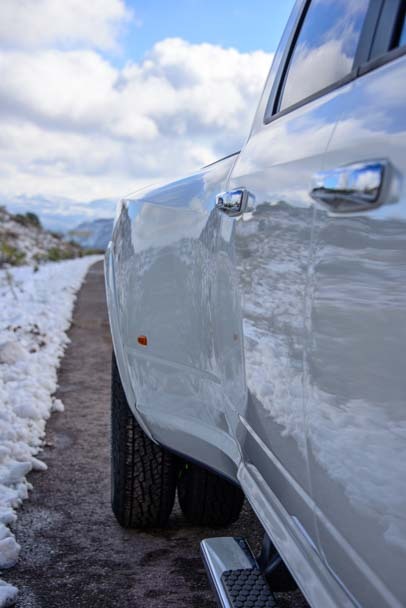 In a Regen, a higher quantity of fuel than normal is pumped into the engine to make it run hot so the particulates can be burnt off. 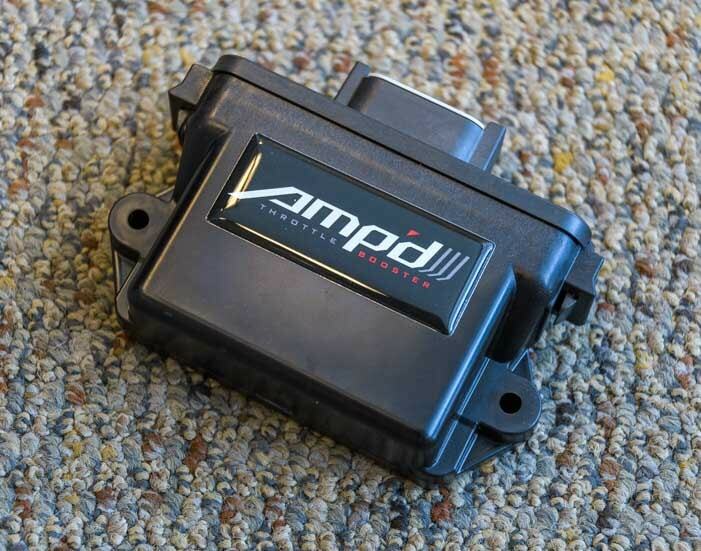 This wastes fuel and ultimately lowers the truck’s overall fuel mileage. 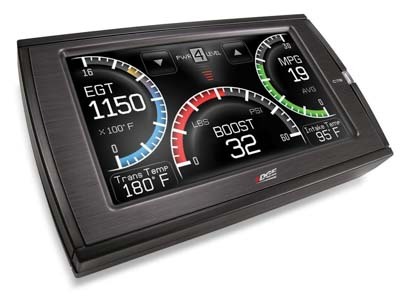 The newer engines that use SCR technology (and DEF) don’t need to go into a Regen quite as often. 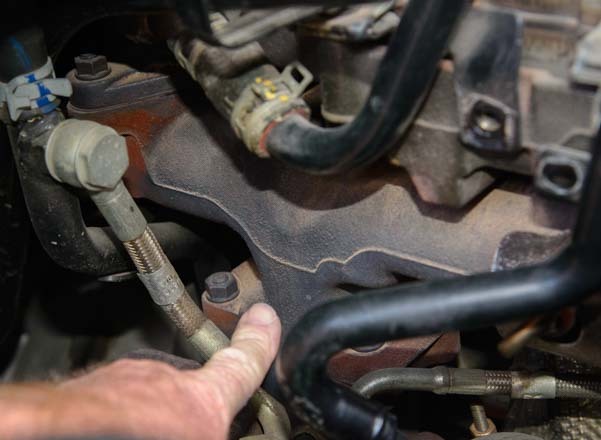 For more info on all of this, there are lots of links below that explain the history and mechanics behind Diesel Exhuast Fluid. 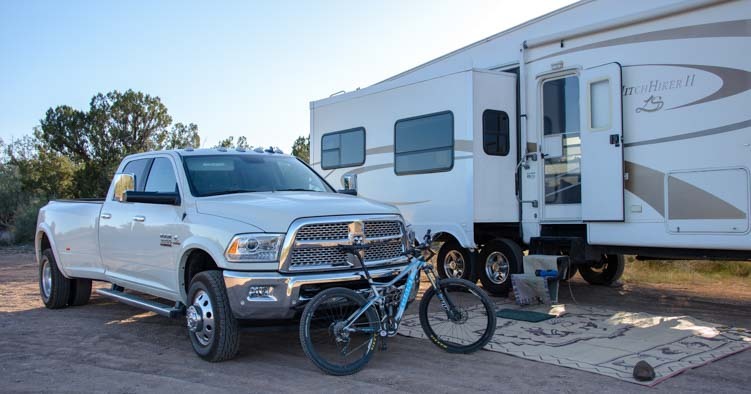 The B&W Companion OEM fifth wheel hitch uses the new and very clever puck hitch mounting system that can be ordered with Ram and Ford trucks in their fifth wheel and gooseneck towing prep packages. 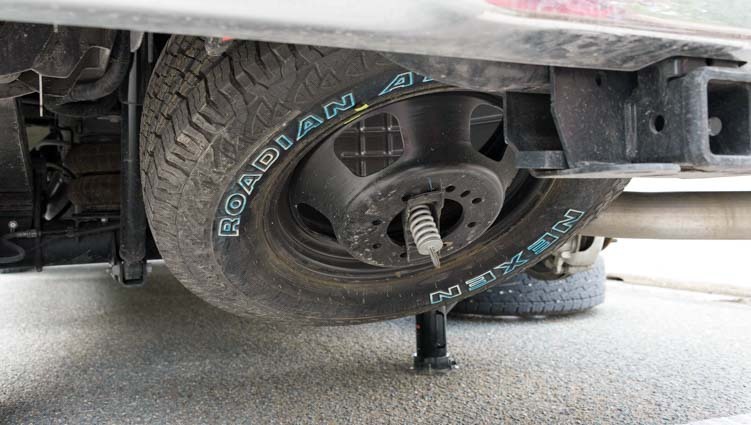 This truck option has five “pucks” installed in the bed of the truck: four in the corners to mount a fifth wheel hitch and one in the center for a gooseneck. 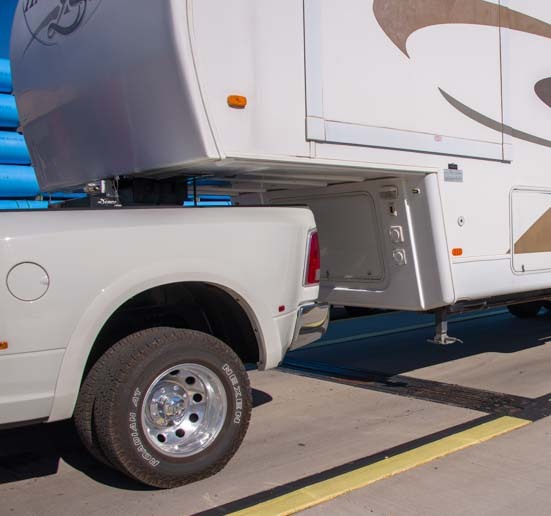 The new style fifth wheel hitches that are designed for these puck systems stand on four legs that each have a quarter turn locking mechanism at the foot to secure them into the four pucks in the bed of the truck. 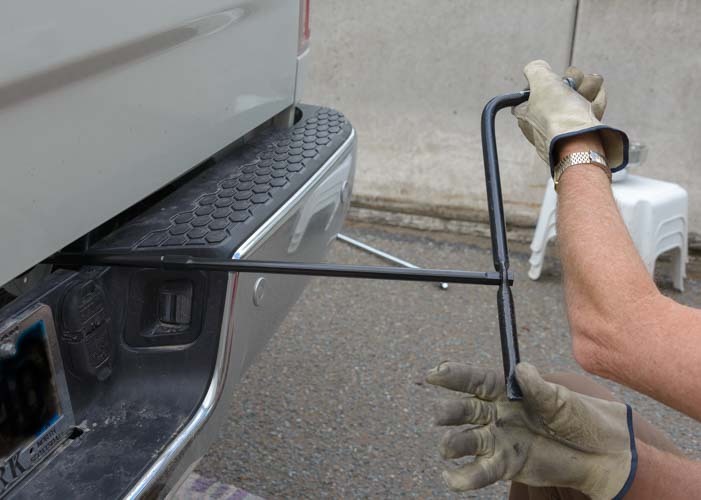 This allows the hitch to be installed or removed from the bed of the truck easily. 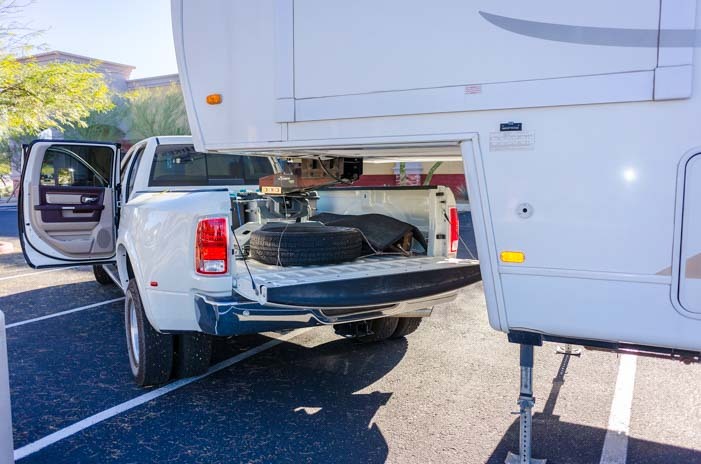 When the hitch is removed, the truck bed floor is totally flat and free of obstacles, because there are no hitch rails to get in the way. 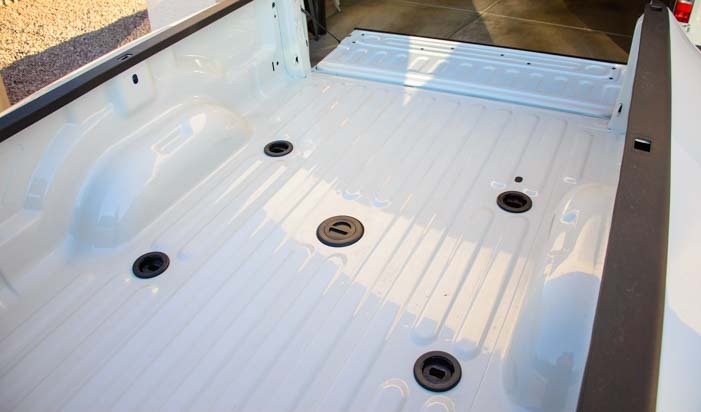 Ford, GM and Ram have different puck layouts in the beds of their trucks. B&W hitches have long had a stellar reputation in the RV industry, and when our 36′ Hitchhiker fifth wheel trailer was getting a slew of big repairs done at the NuWa factory service center in Chanute, Kansas, (thank goodness for our RV warranty), we discovered B&W Trailer Hitches was just a ways down the road. So we took a factory tour of the plant. 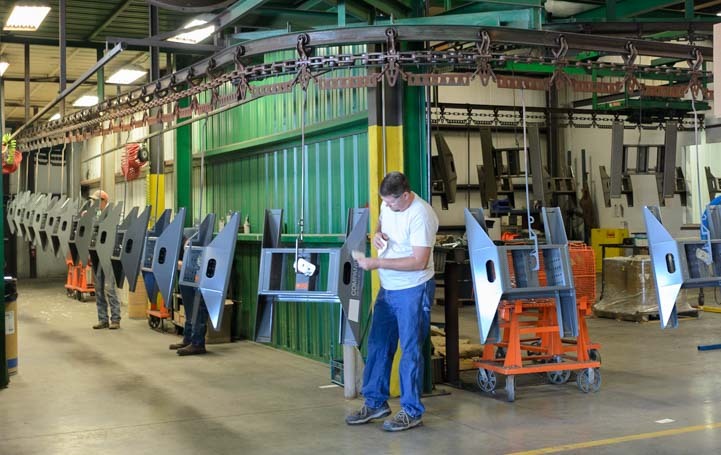 All of the hitches manufactured by B&W Trailer Hitches are on display at the manufacturing plant. 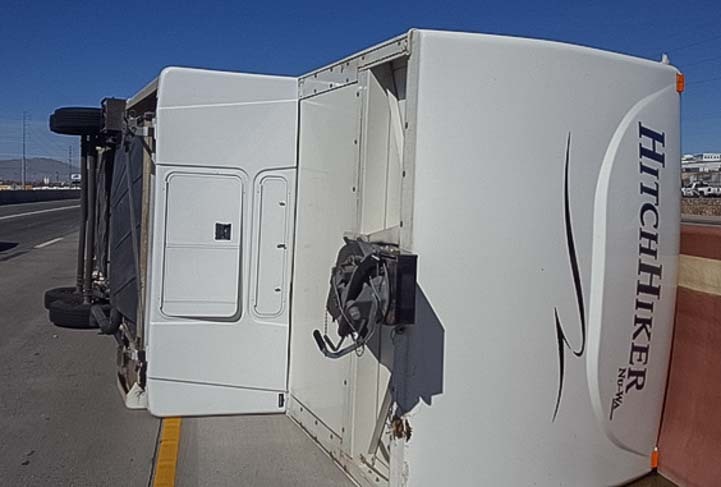 What struck us more than anything is that B&W Trailer Hitches is a company that cares. They not only turn out a superior product, but they take take care of their employees. 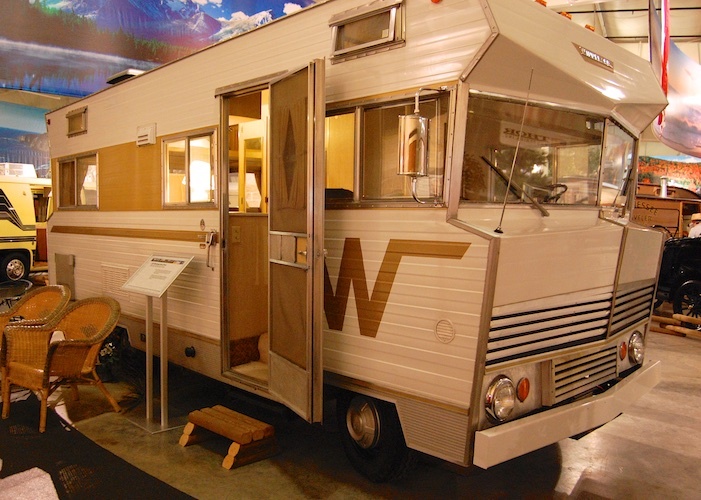 When the RV manufacturing industry went into a steep nose dive in the years following the financial debacle of 2008, many of the employees that had worked at NuWa industries building fifth wheel trailers eventually found employment over at B&W Trailer Hitches as NuWa’s need for workers shrank. And when B&W didn’t have enough work for everyone to do, the company paid their employees to do city maintenance work in their hometown of Humboldt, Kansas. How cool is that. And how RARE is that?! Mark checks out one of the hitches on display at B&W. 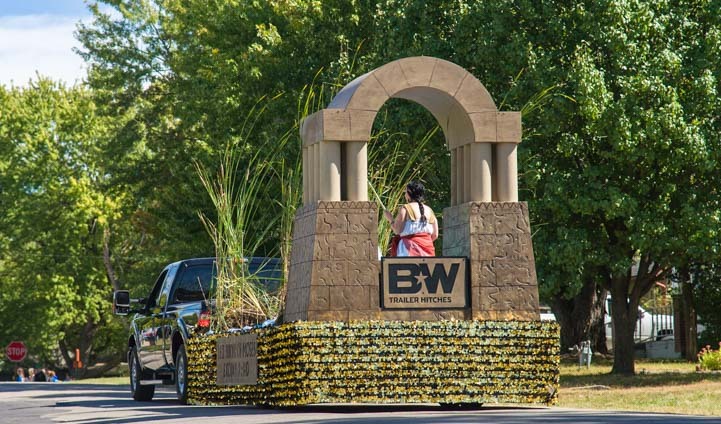 We got a taste of just how deeply these community values run when we saw the Biblesta celebration and parade during our visit to Humboldt, Kansas. 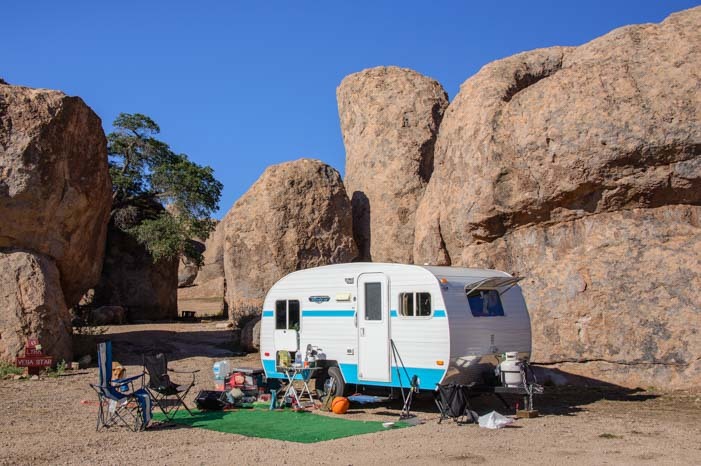 In an age of political correctness when many people are afraid to express their beliefs publicly, this is a town that has been openly celebrating Christianity in an annual festival for the past 52 years. 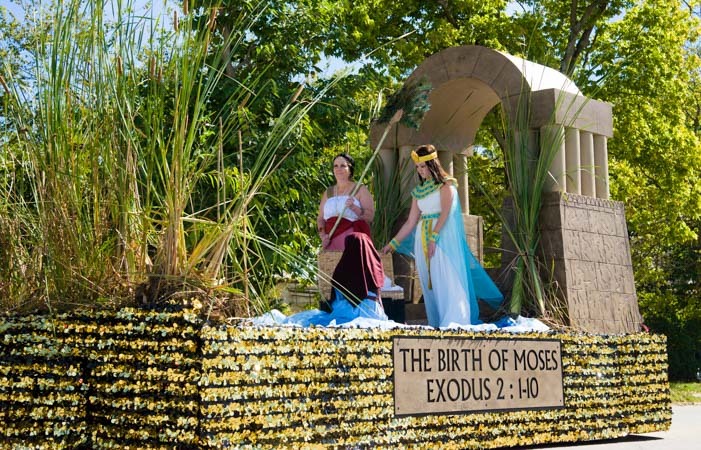 All the churches in the area — as well as B&W Hitches — have a float in this extraordinary parade. 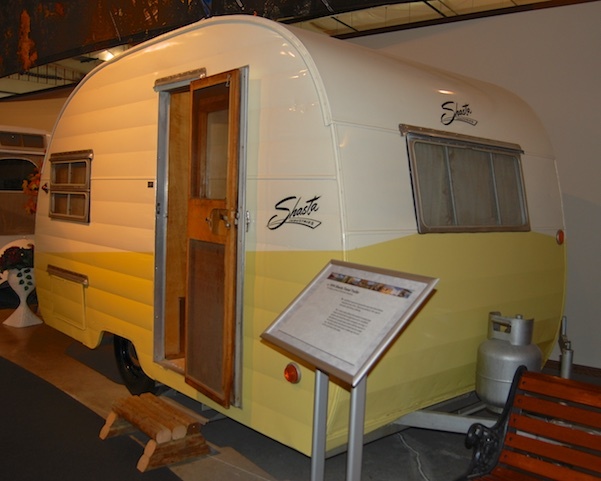 Read our blog post about it here: America’s Heartland – Is It In Humboldt Kansas? 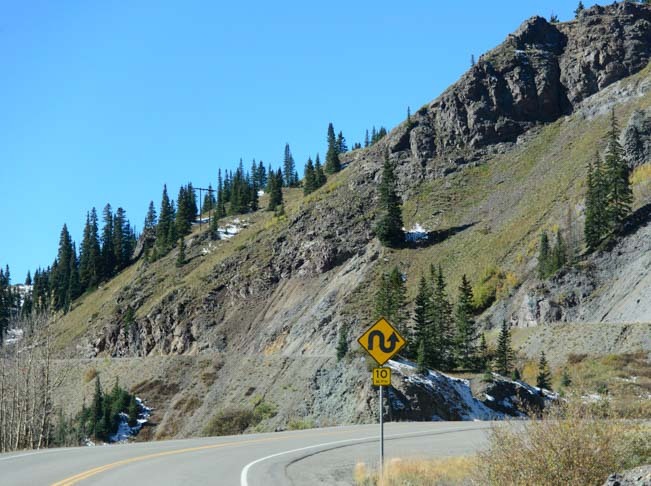 Founded in 1987 by Joe Walker and Roger Baker as B&W Custom Truck Beds, the company long ago became B&W Trailer Hitches. 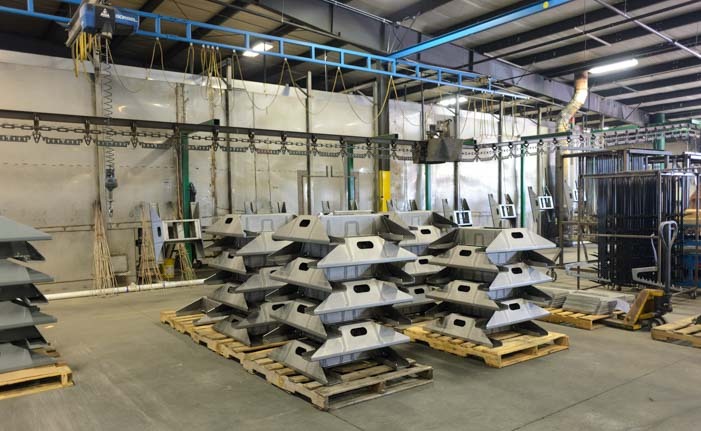 They still build custom truck beds, but the company has grown and now manufactures many other products. 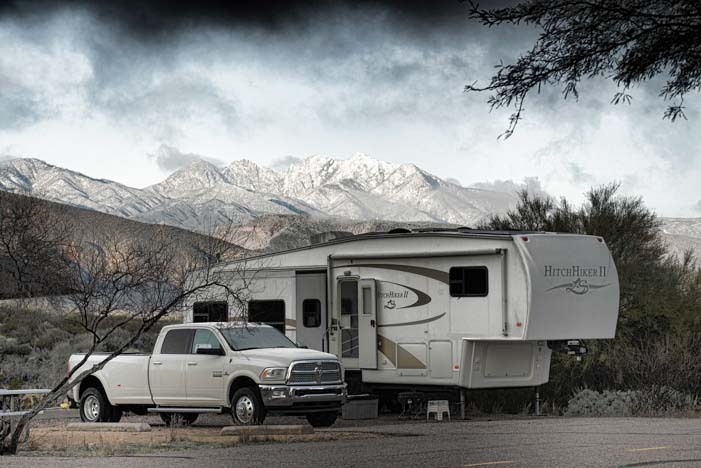 In 1991, B&W invented the clever turnover ball for gooseneck hitches, and that put them in the forefront of the towing industry. 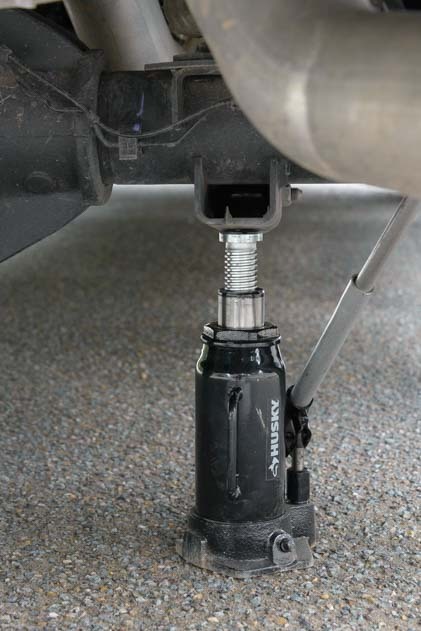 For trucks that have a gooseneck socket in the bed of the truck, the turnover ball gets inserted this socket and a fifth wheel hitch can be installed that latches onto the ball and also onto rails that are installed under the bed of the truck. 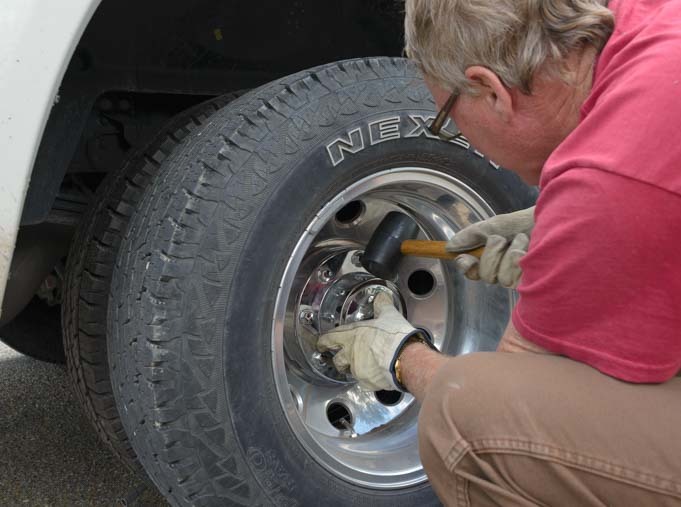 When the fifth wheel hitch is removed, the turnover ball can be turned over to make the bed of the truck completely flat since the rails for the hitch are under the bed. 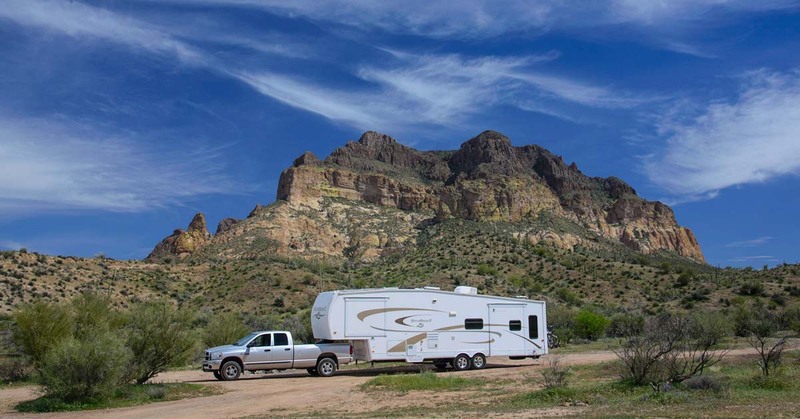 This makes the entire bed of the truck available for hauling when the fifth wheel hitch isn’t installed, and it also allows the truck to be set up for either gooseneck or fifth wheel towing really easily. 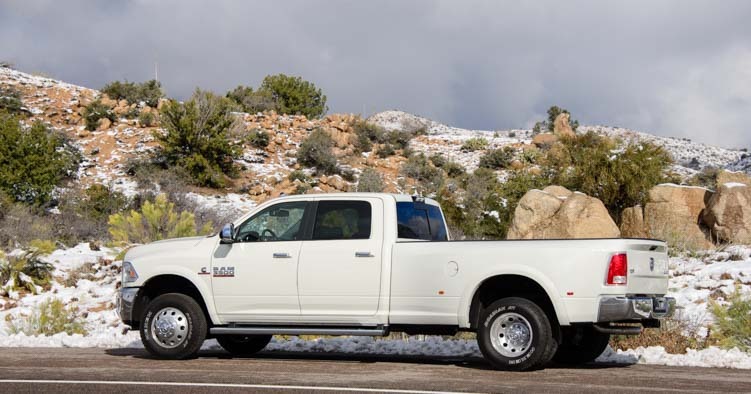 This is handy out in ranch country where one truck might tow a variety of trailers, and also be used to haul big loads. B&W hitches on the assembly line in Humboldt, Kansas. 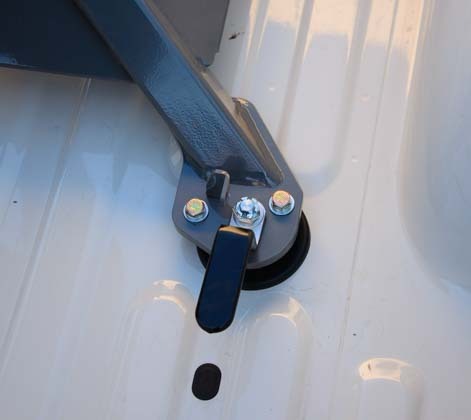 The new puck style hitch mount offered by the truck manufacturers is a similar concept. 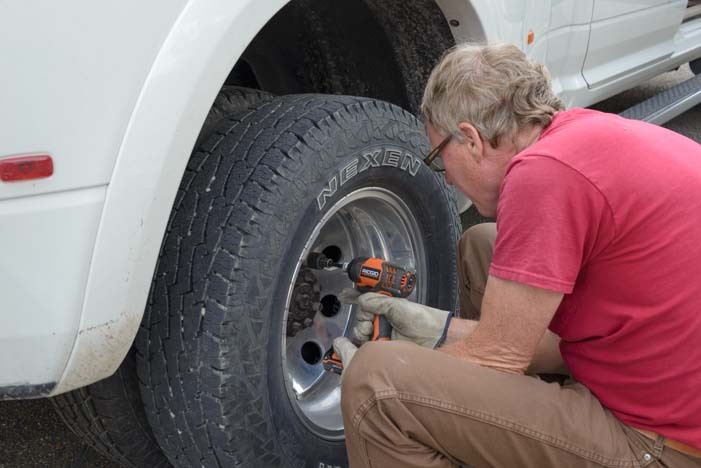 Rather than just one connection point between the 5th wheel hitch and the truck bed in the center, there are four points of contact in the four corners. 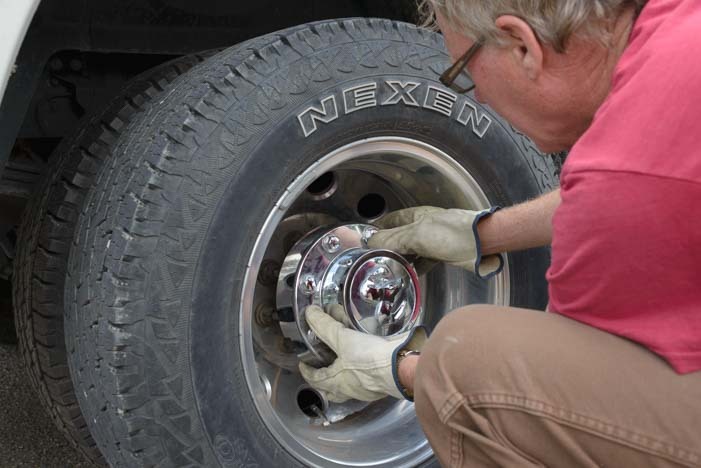 The four puck system also allows for an even heavier duty weight rating on the biggest fifth wheel hitches, so larger fifth wheel trailers can be towed. 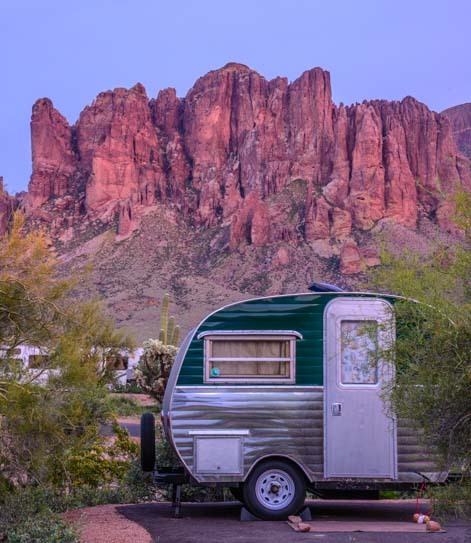 B&W Trailer Hitches is into quality, and one of the things that sets their hitches apart is that they are made from American steel. 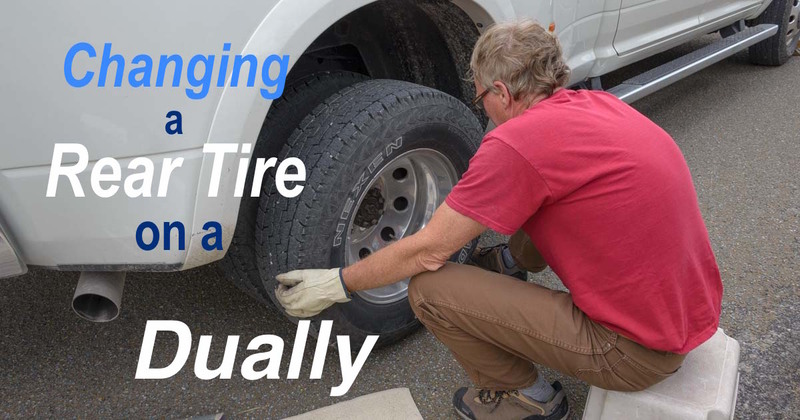 Since we have dealt with axle and leaf spring problems on our trailer several times over the last year, we have come to realize just what a huge difference there is between Chinese made steel and American steel. 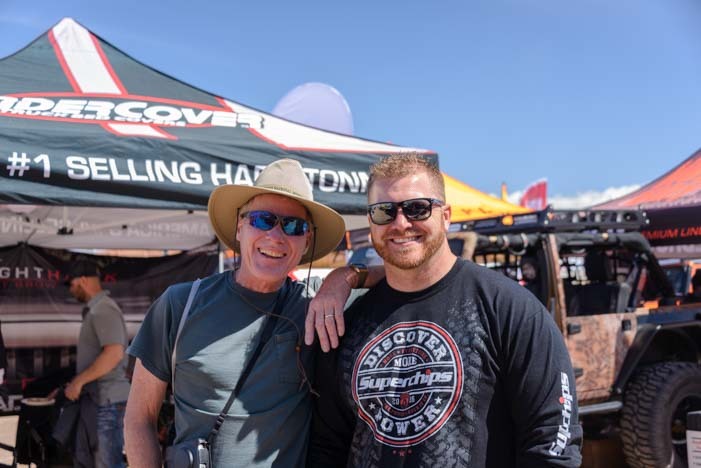 When it comes to something that puts your life on the line because it is carrying heavy loads, American made steel is the only way to go. Another hallmark of quality in B&W hitches is that the nuts holding the hitch base to the truck are castle nuts. 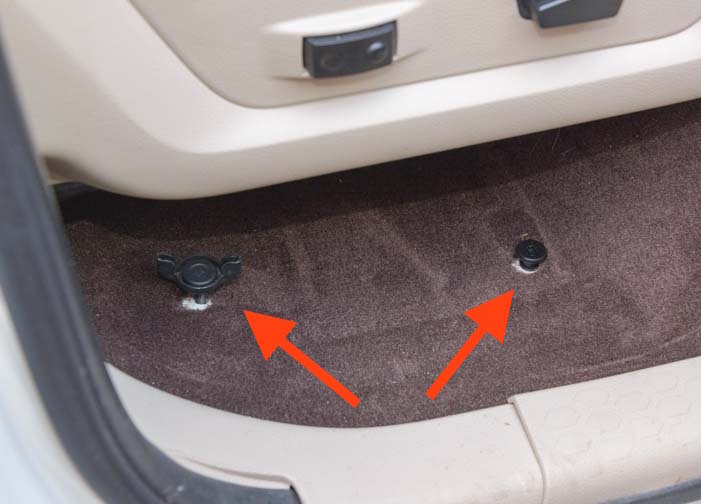 This means you can lock them with a sheer pin so they don’t back out. 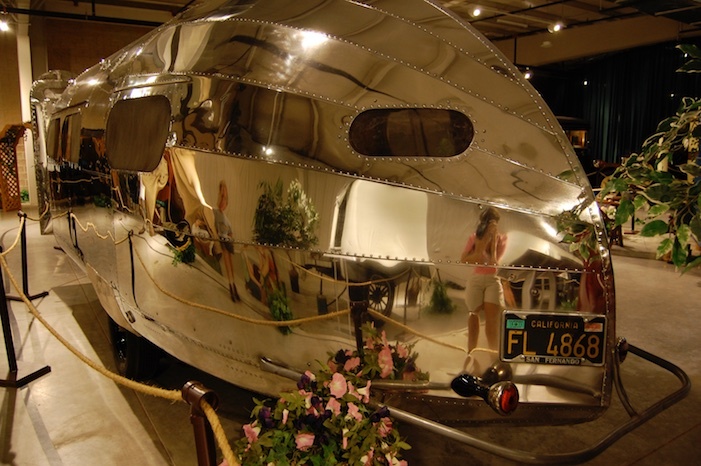 Also, just about everything at B&W Trailer Hitches is done in-house. 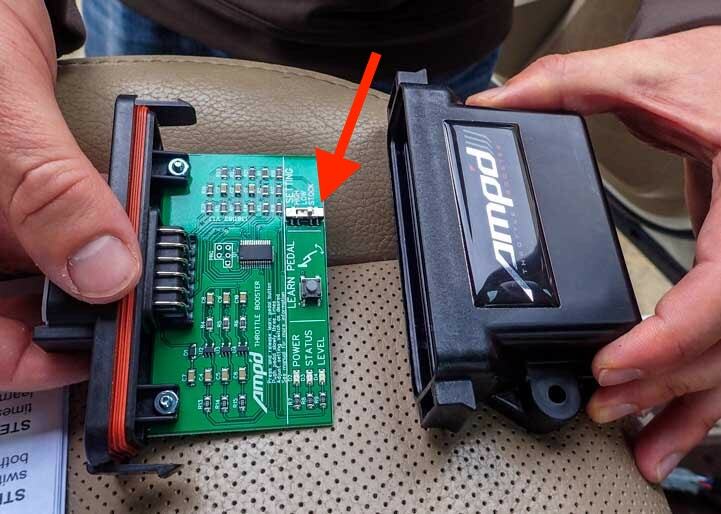 That way, they can retool the assembly line easily, as needed, for instance, if they improve the design or the puck layout is changed by the truck manufacturers. 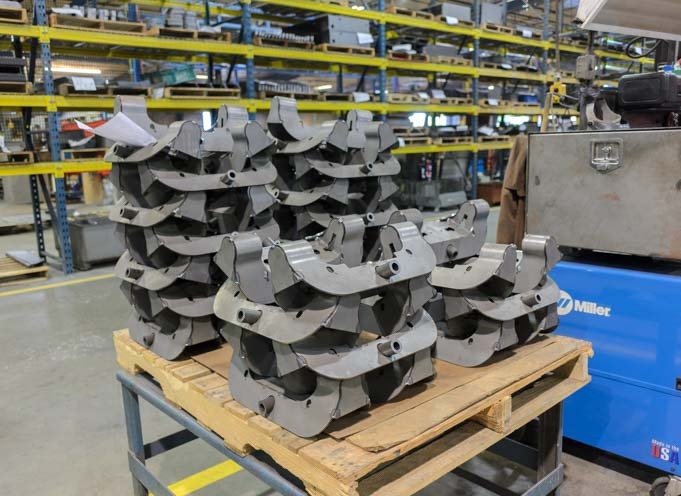 Stacks of fifth wheel hitch couplers (the top part of the hitch). Lots of metal shavings are generated in the production of hitches on the B&W assembly lines. 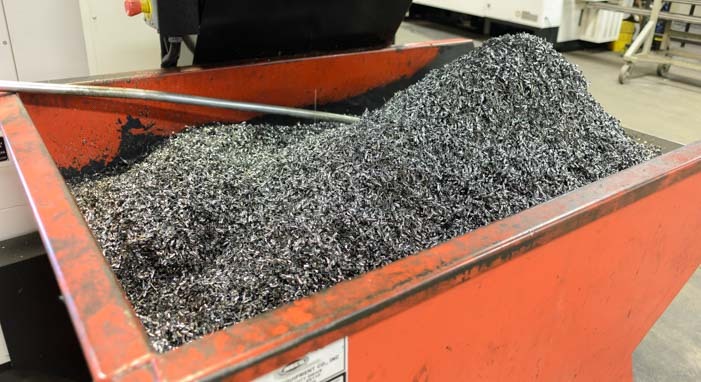 We were impressed that B&W recycles all the metal shavings at Missouri Metals. Very green! We chose the 25,000 lb. B&W Companion OEM fifth wheel hitch. This is way overkill for our 14,100 lb. 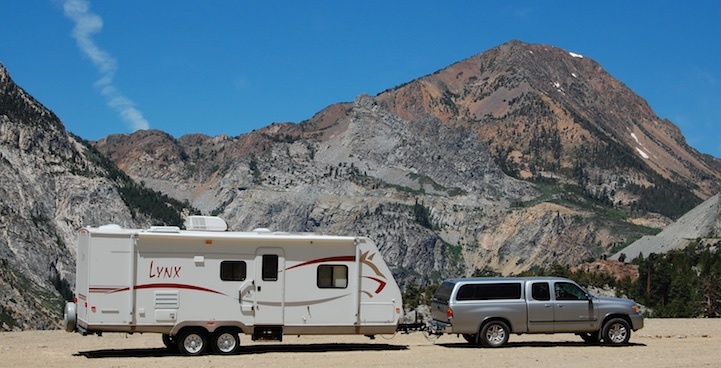 trailer, but our goal in our whole truck-and-hitch upgrade was to be able to tow our fifth wheel effortlessly. 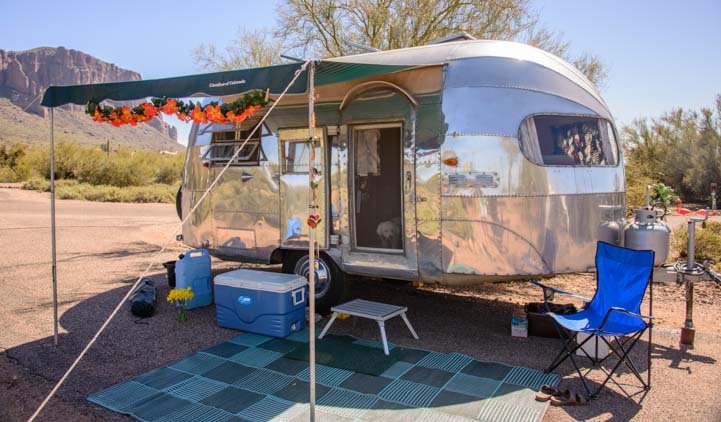 It also gives us options down the road in case a day comes when we want to replace our trailer with something bigger or beefier. 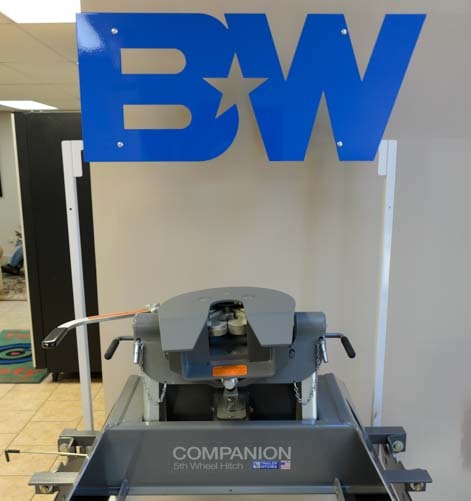 The whole installation of the B&W Companion OEM 5th wheel hitch could easily be done right in the bed of the truck, but we we got the hitch before we got our truck! So, we did it in two stages. 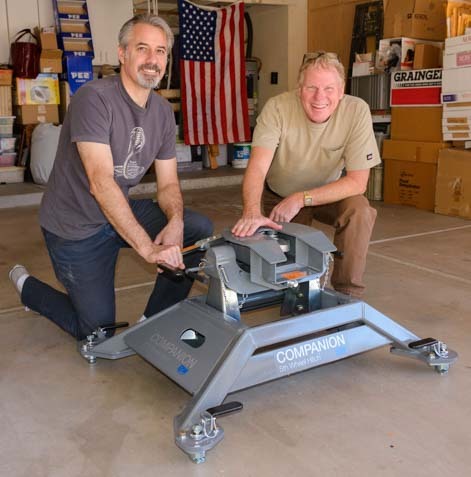 First we assembled the hitch in a friend’s garage. This took 40 minutes. 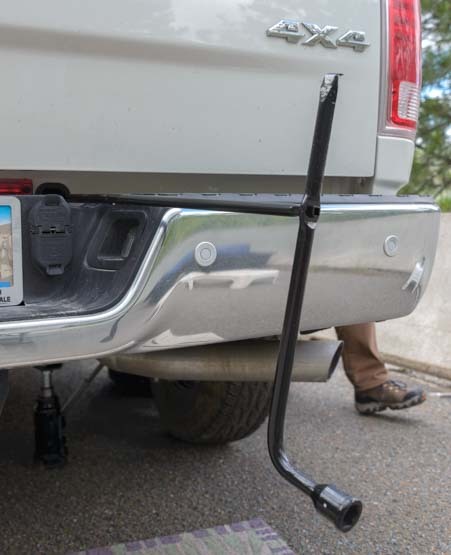 Then, once we got our new truck, we installed the hitch in the bed of the truck. This second stage took 20 minutes because we needed to fine tune the mating of the four pucks and the four legs. 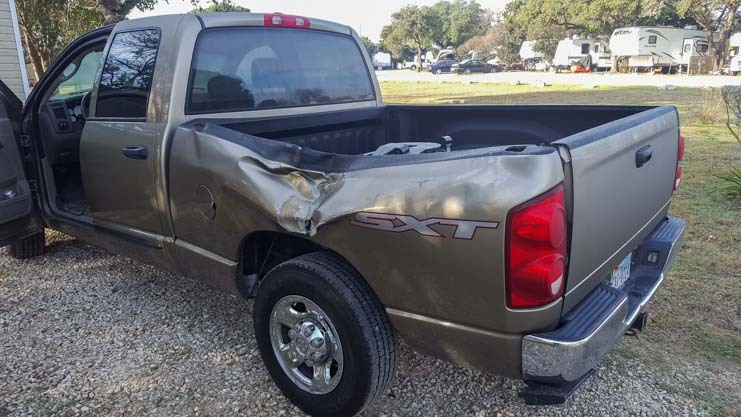 In the future, lifting the hitch in and out of the truck bed will take just a few minutes. 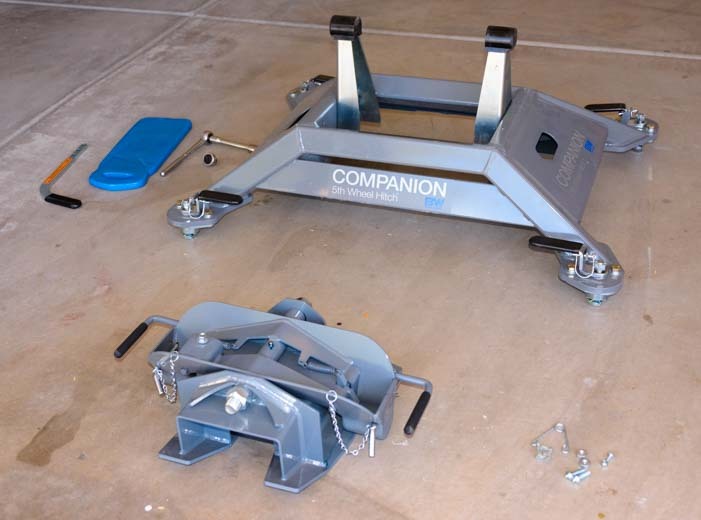 So, it’s about a one hour DIY job to install a B&W Companion 5th wheel hitch right out of the box. 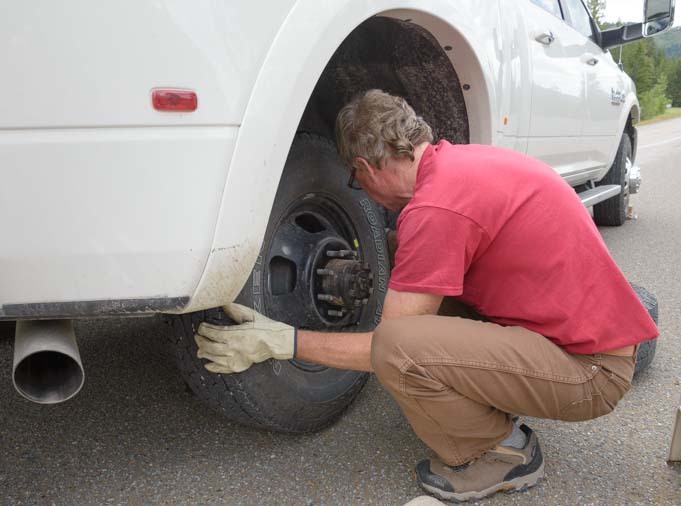 That’s a huge improvement over paying the fifth wheel dealership to do a two hour installation like we did when we installed our first fifth wheel hitch in our first truck! 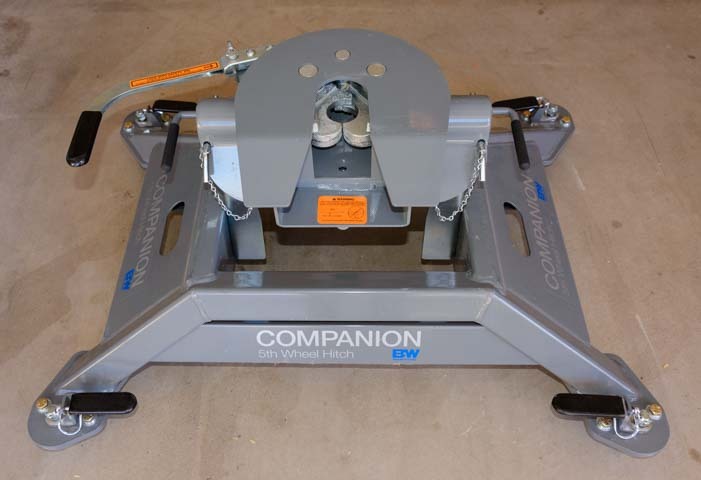 Our B&W Companion OEM fifth wheel hitch was shipped to our friend’s house by UPS. It came in two boxes. 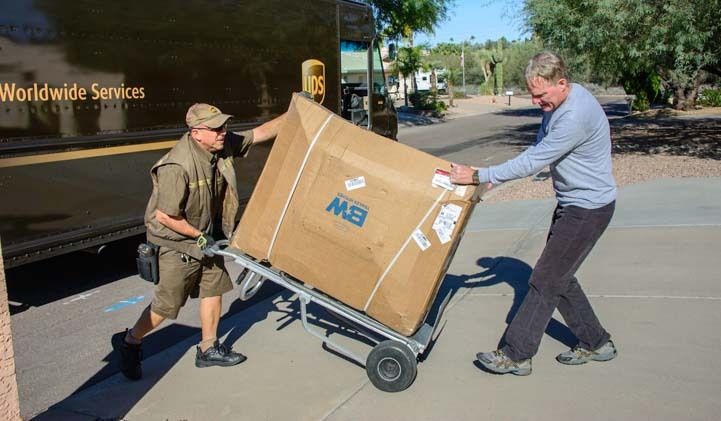 Exciting day — UPS delivers our hitch! There is a base and a head (or coupler) and assorted parts. We laid them all out to get a look at them. We lay out all the parts and the instructions. 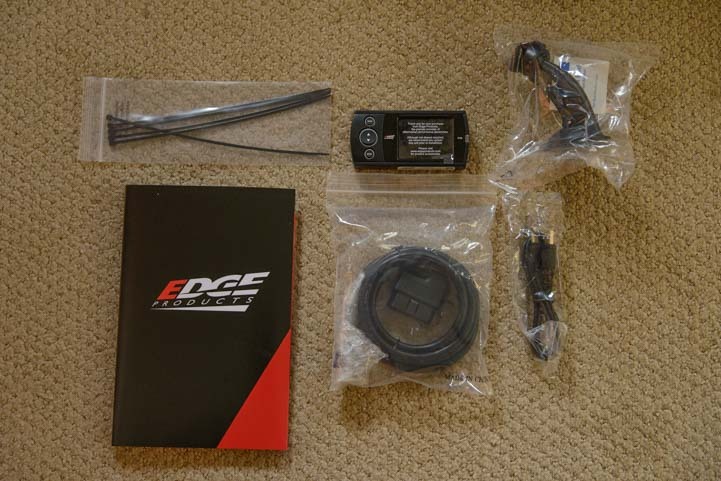 There is a one page installation instruction sheet that comes with the kit (also available online here). 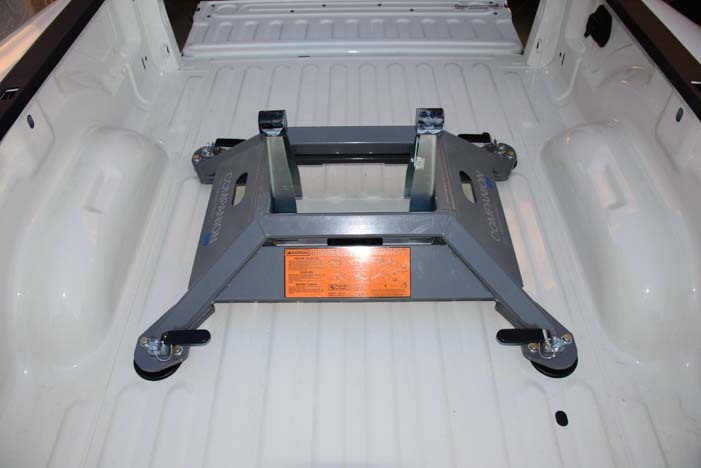 There’s also a sticker on the hitch base with instructions for mounting the hitch’s two parts into the truck bed. 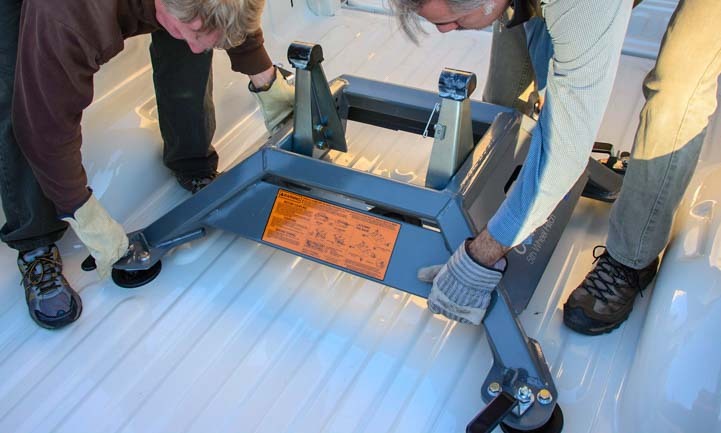 The orange sticker on the hitch base has instructions for mounting the hitch in the truck bed. The sticker faces the truck cab. 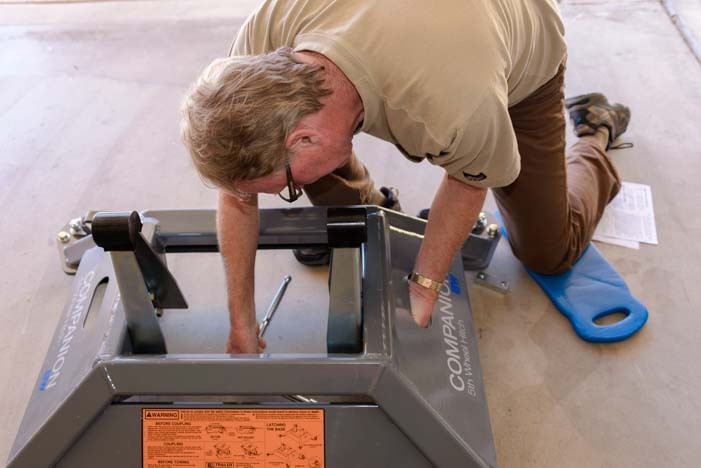 The first step is to install the big triangular pivot arms that support the hitch coupler (the top part of the hitch). 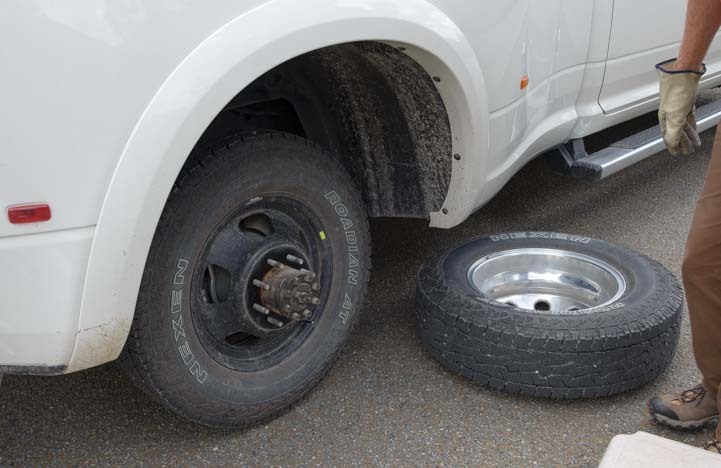 The orientation of these triangular pieces depends on the placement of the hitch over the axles, which varies by truck model. 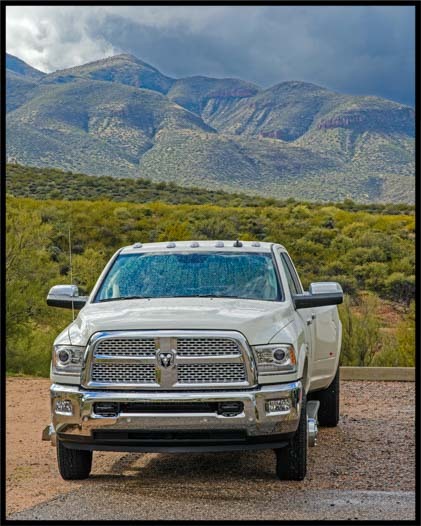 In the case of the Ram 3500 dually long bed, they are oriented so the shallower slope goes towards the cab of the truck. 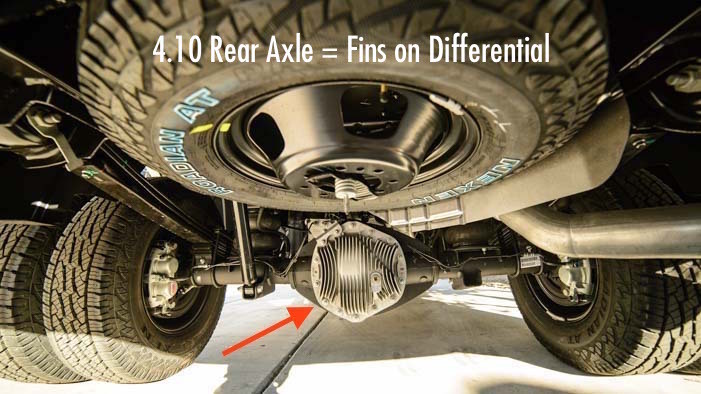 The hitch has a big orange sticker on the side that faces the cab, so the shallow slope of the pivot arms faces that sticker. The shallow sloping side of the pivot arm faces the truck cab in our installation. 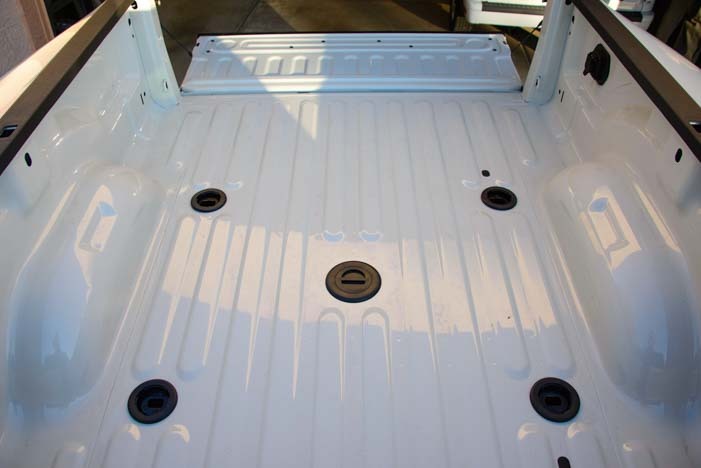 The pivot arm orientation varies with the type of truck bed. 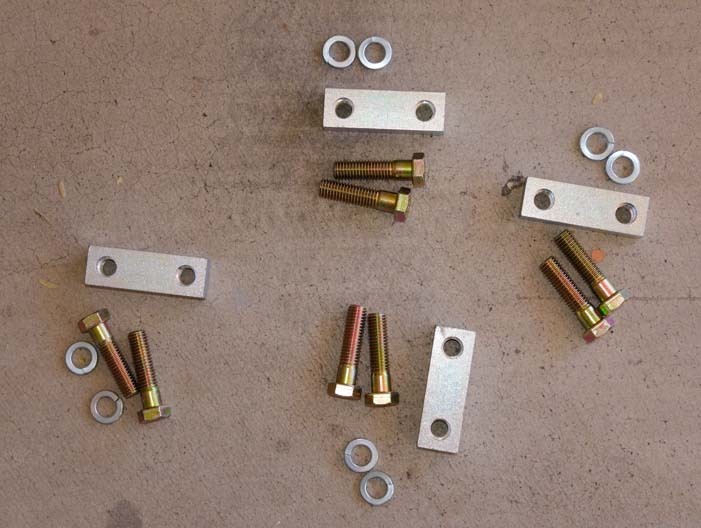 There are four pairs of lock washer and bolts, two for each pivot arm. 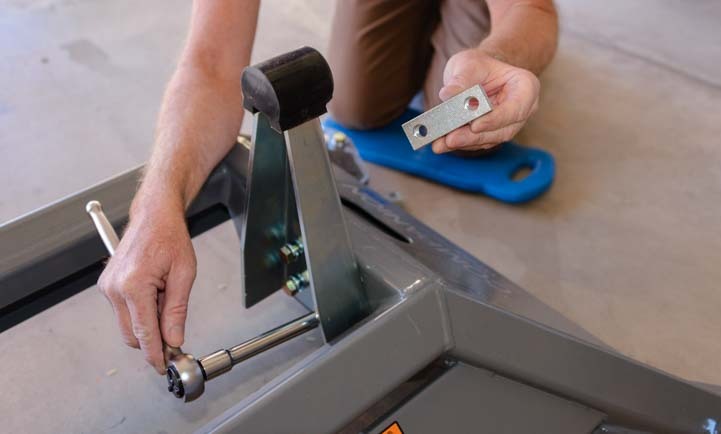 There are five possible holes, so you can set the height of the pivot arm higher or lower, which will change the gap spacing between the overhang of the fifth wheel trailer and the sides of the truck bed. We chose the middle setting for starters. 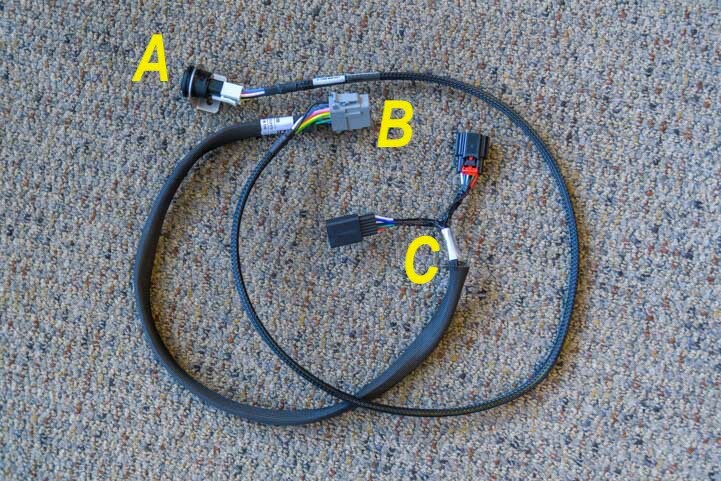 The pivot arms are attached using these parts. 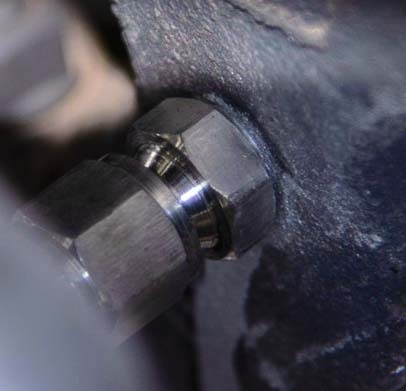 The bolts and lock washers screw into the threaded block an the back side of the pivot arms. 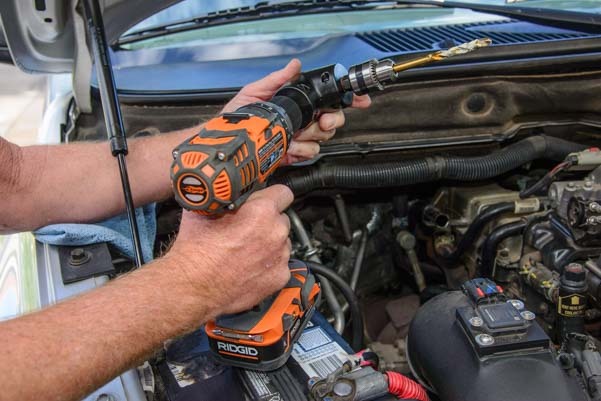 Use a socket and ratchet to tighten the bolts. 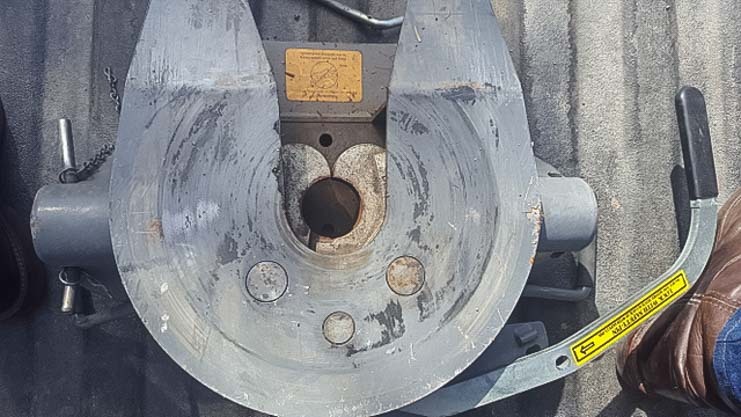 The bolts screw into a threaded block plate on the back side. 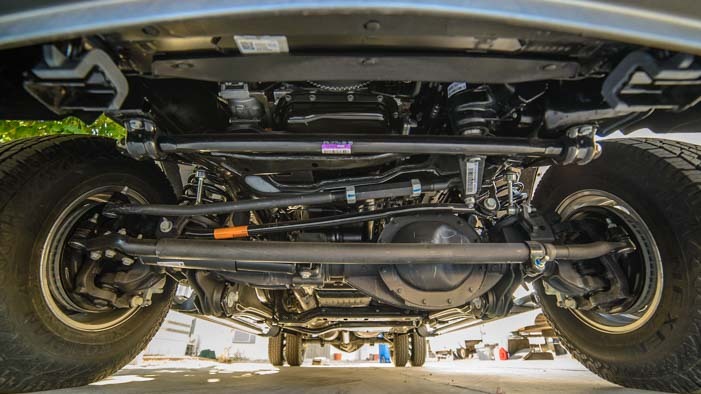 The next step is to install the wire torsion spring on the flange on the driver’s side pivot arm that is closest to the truck cab. 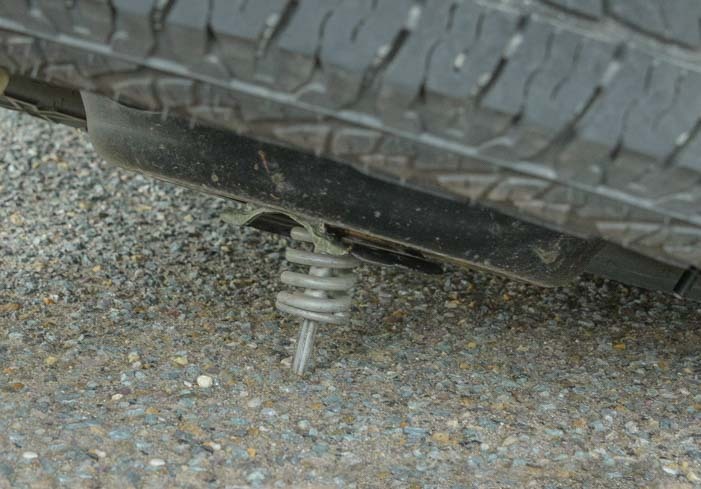 The wire torsion spring is next. 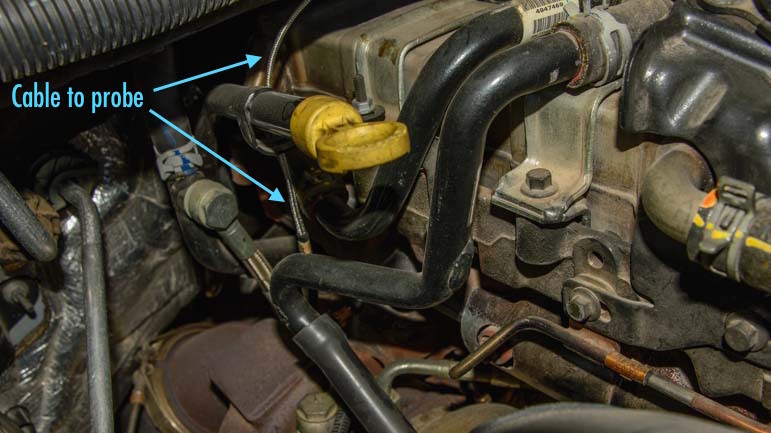 The mounting clip (below the spring in the photo above) is attached to the spring. 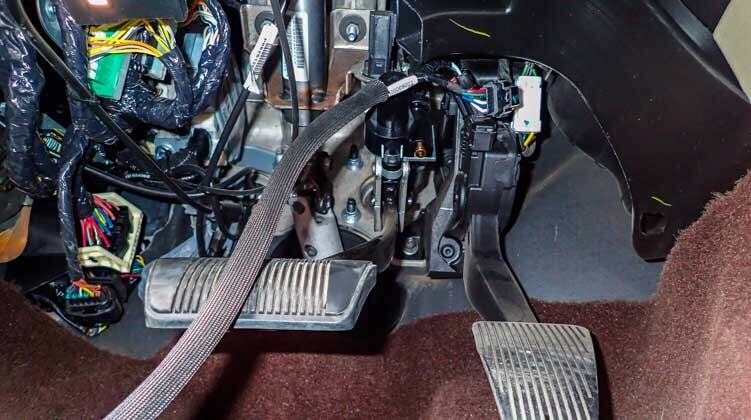 Then the spring is installed so there is 1/2″ of clearance between the top of the spring and the bottom of the rubber bumper on the pivot arm. A few taps with a small hammer secured the clip onto the flange. Now the pivot arms are fully installed on the hitch base. The two pivot arms are in place (photo is prior to mounting the torsion spring). 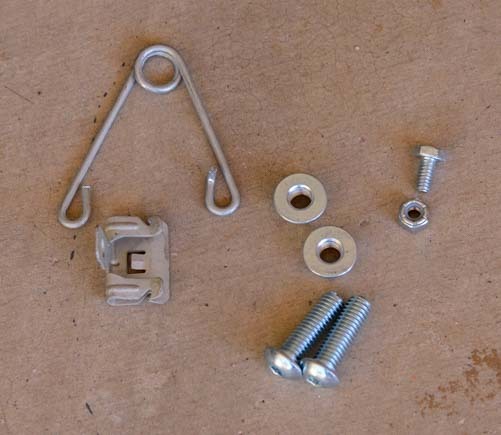 The next step was to put the hitch head — the coupler — onto the hitch base and install its handle and three safety pins. The coupler (top of the hitch), seen upside down here, is next. 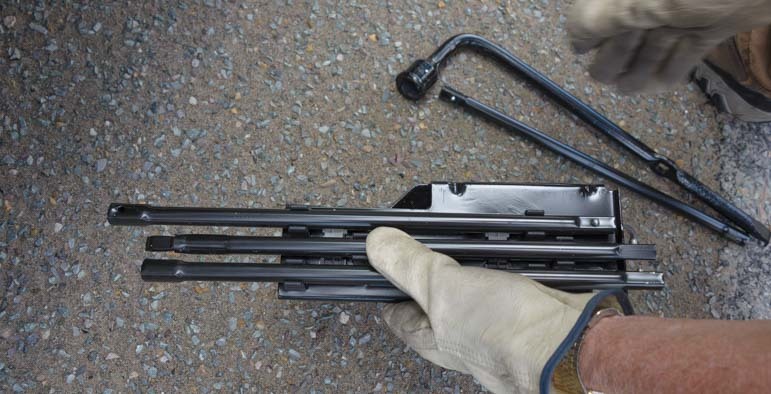 We lubricated the rubber bumpers on the tops of the pivot arms with CRC Lithium Grease. 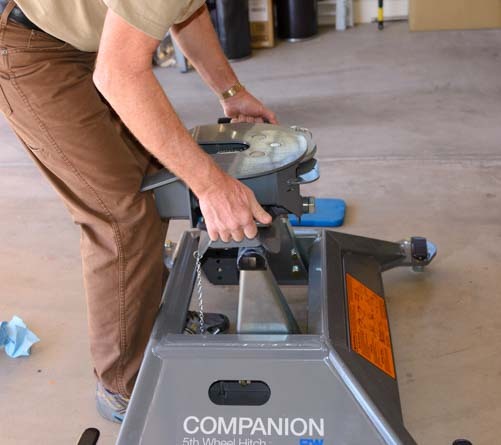 Then, holding the coupler by the two saddle handles on either side, Mark placed the coupler onto the hitch base. 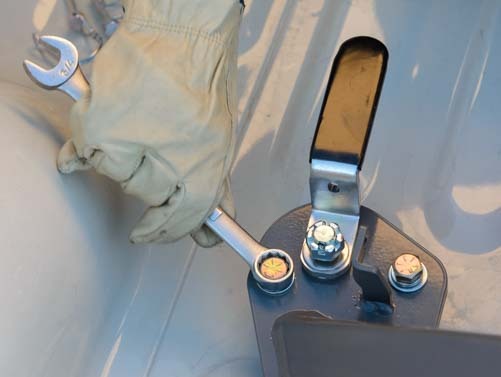 When you set the coupler down on the base, press down on the handles to secure it. 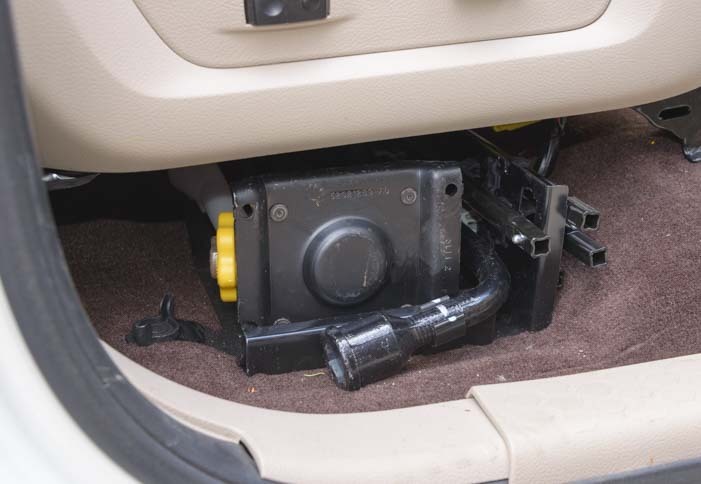 The coupler rests on the hitch base. Saddle locking pins under the two saddle handles prevent it from lifting up. 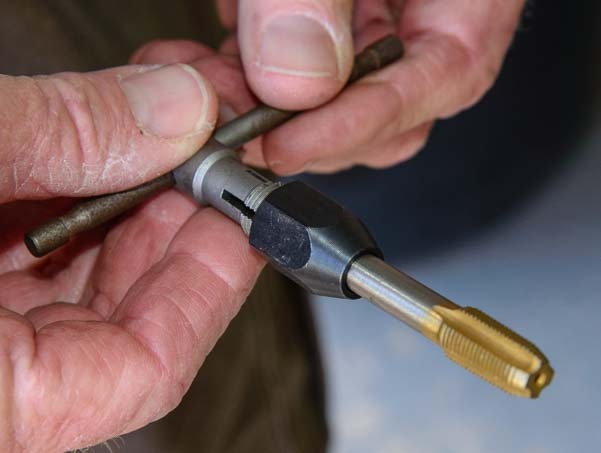 A “hairpin” holds the saddle locking pin in place. 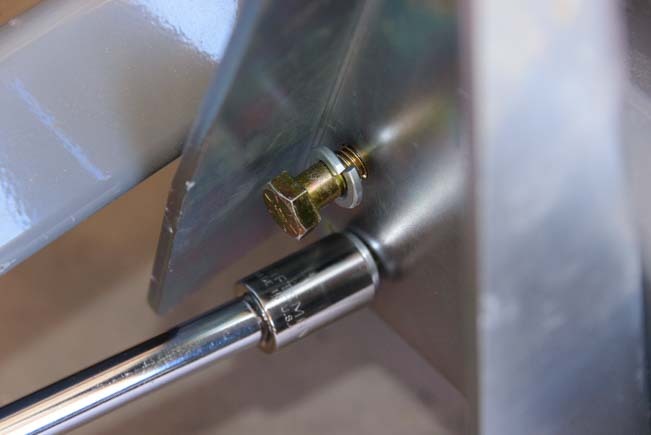 A saddle locking pin prevents the coupler from lifting off the base. 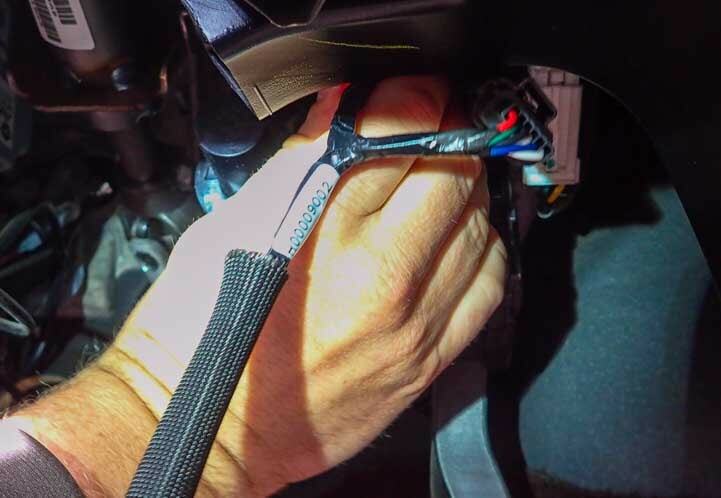 It’s held in place with a hairpin (cotter pin) that is under Mark’s fingers in this photo. 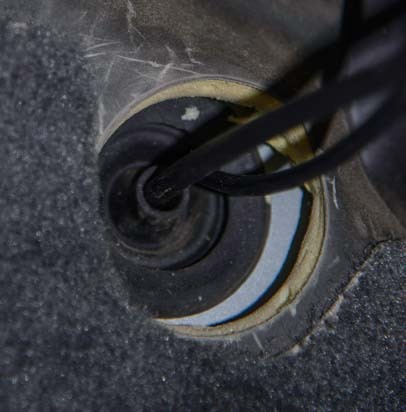 Next, the coupler cam handle gets installed onto the coupler. 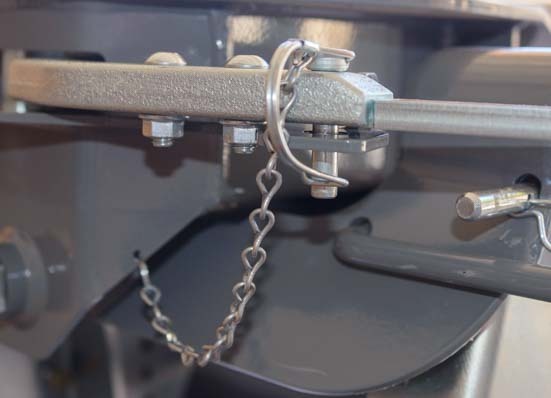 The handle is secured to the coupler with two button head cap screws (tightened with a 7/32″ allen wrench), and it is held closed (or open) with the coupler’s cam handle safety pin. Two button head cap screws and a the cam handle safety pin do the trick. 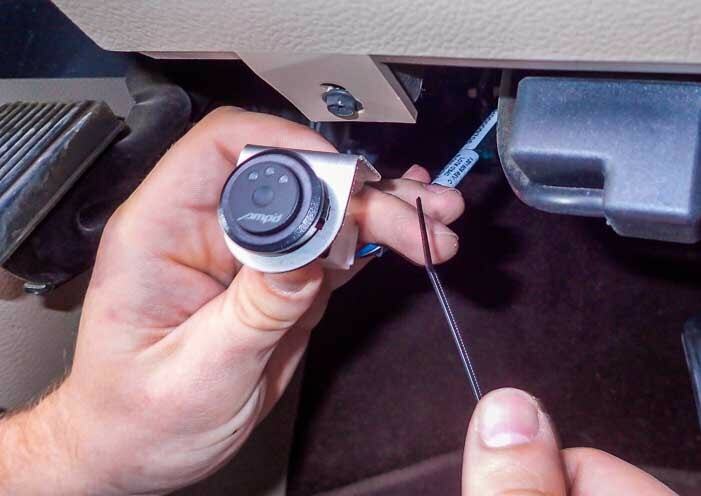 The cam handle safety pin. 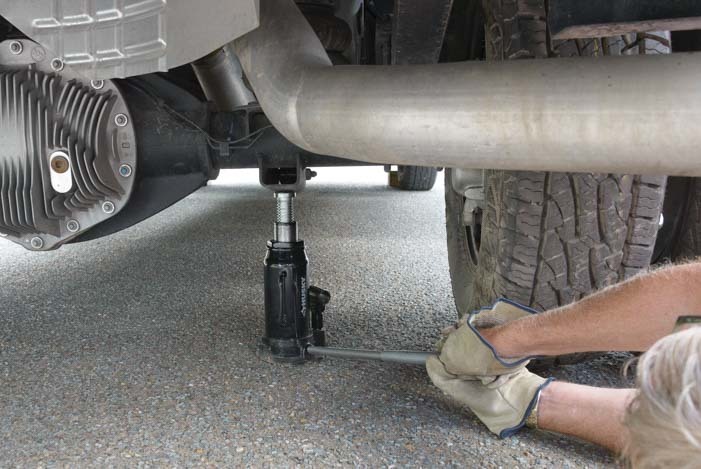 Then lube the inside of the hitch jaws with Lucas Oil X-tra Heavy Duty Grease or a similar automotive chassis grease. Grease the inside of the jaw so the trailer’s king pin can turn smoothly inside. Now all we need is a truck! 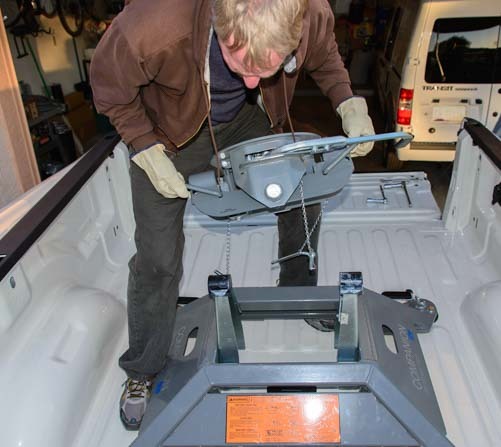 As mentioned above, all of these assembly and installation steps could have been done in the truck bed, but we did not have our truck yet, and we were excited to get started and work on the hitch in the meantime. 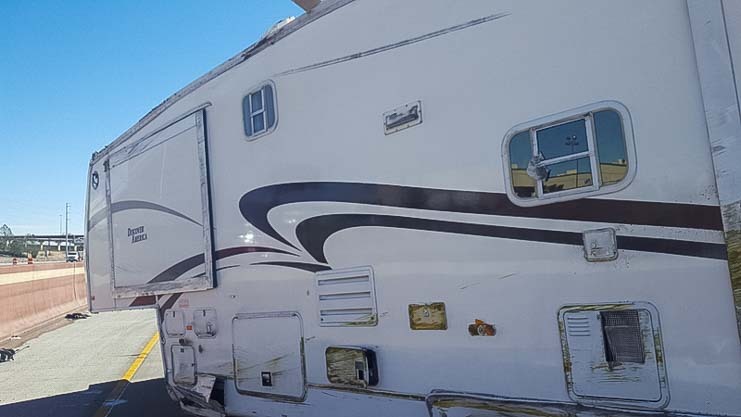 Finally our truck arrived and we had a blast with Alice Cooper as part of the purchase! 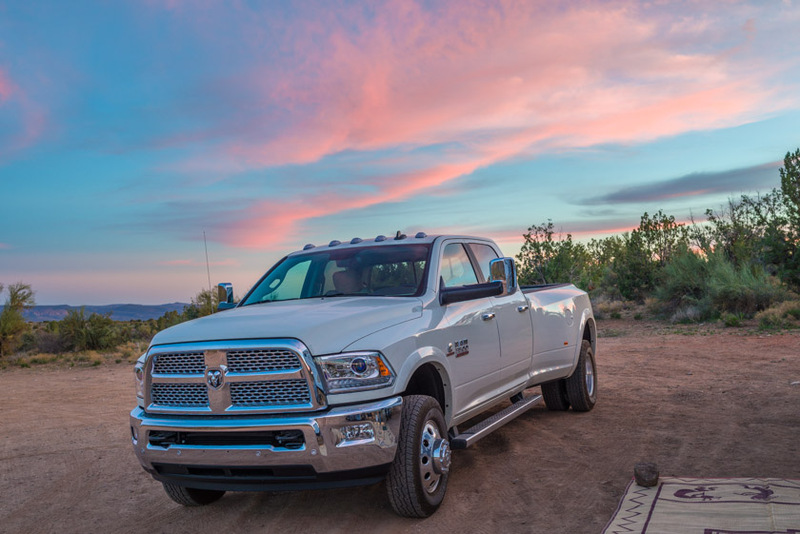 The gooseneck / fifth wheel hitch tow prep package puck system in our Ram 3500 dually truck was ready for the hitch installation. 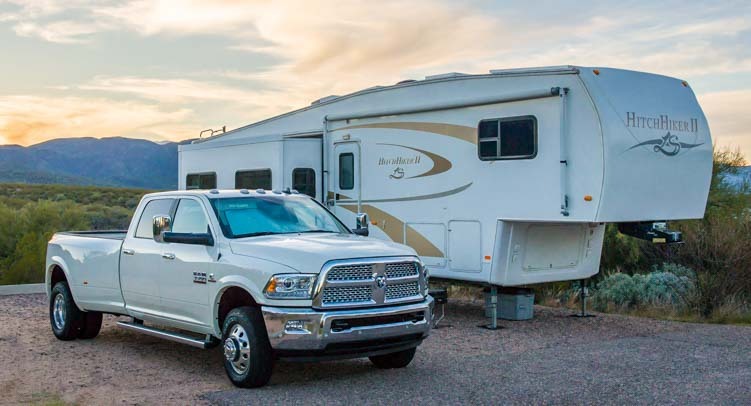 The gooseneck / fifth wheel tow prep package has five pucks in the bed of the truck. 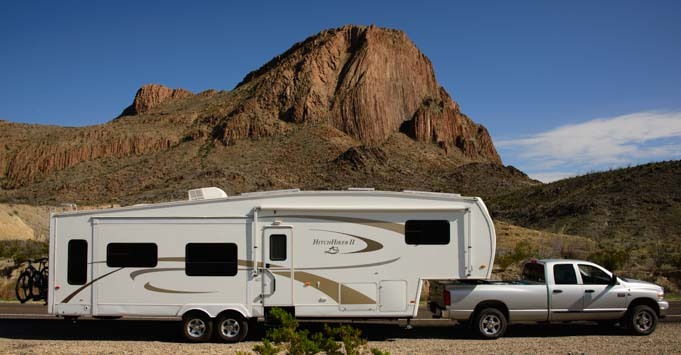 Fifth wheel hitches use the outer four pucks. 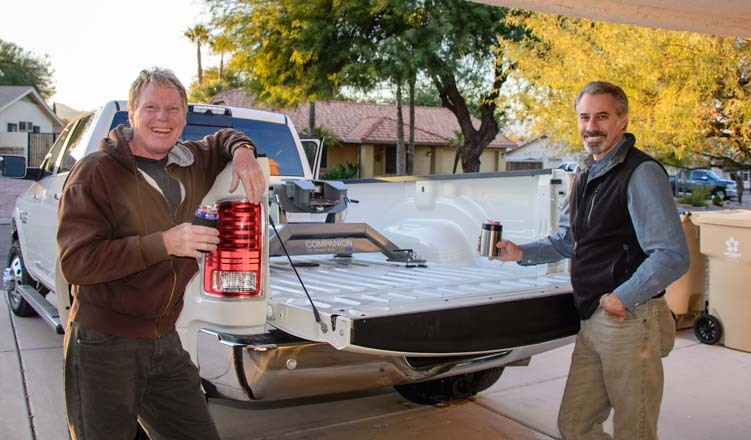 Mark and his buddy lifted the hitch base into the truck bed. 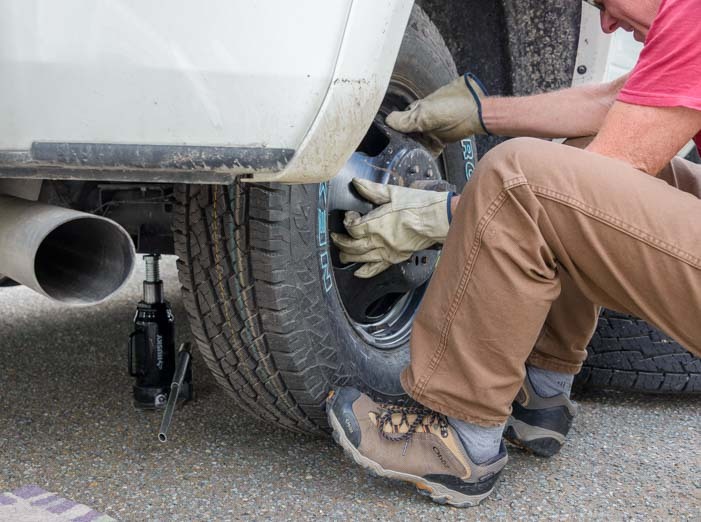 Back in our article about our truck, a reader noted that he hoists his fifth wheel hitch in and out of his truck bed using a hydraulic lift table. 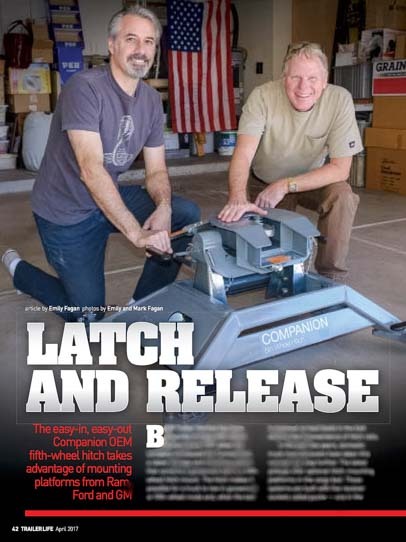 If you are going to be moving the fifth wheel hitch in and out of your truck bed a lot, and you have the garage space, and you don’t have a strong, strapping friend at your beck and call to help you, this seems like a super idea. 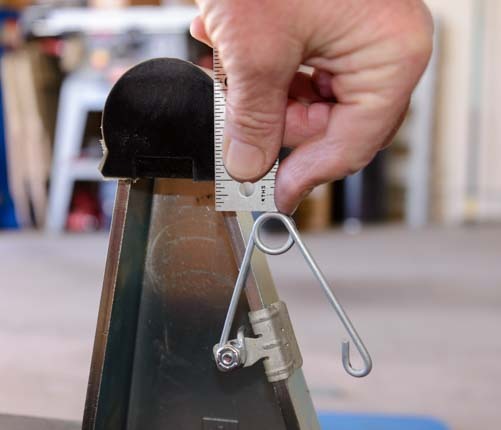 Hitch base – 131 lbs. 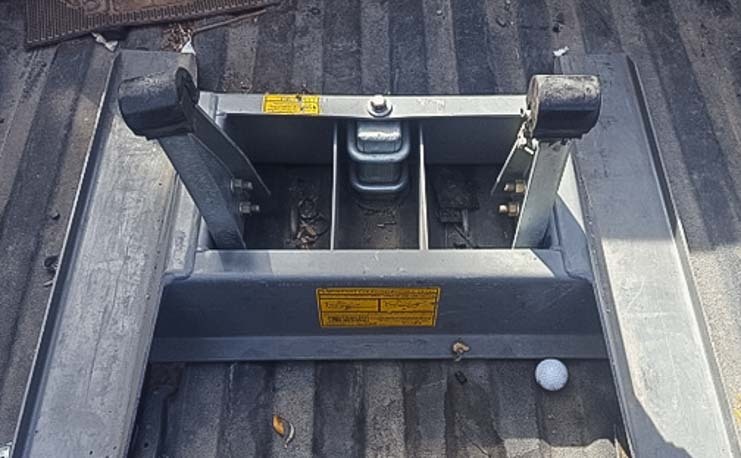 The hitch base is placed in the bed of the truck. 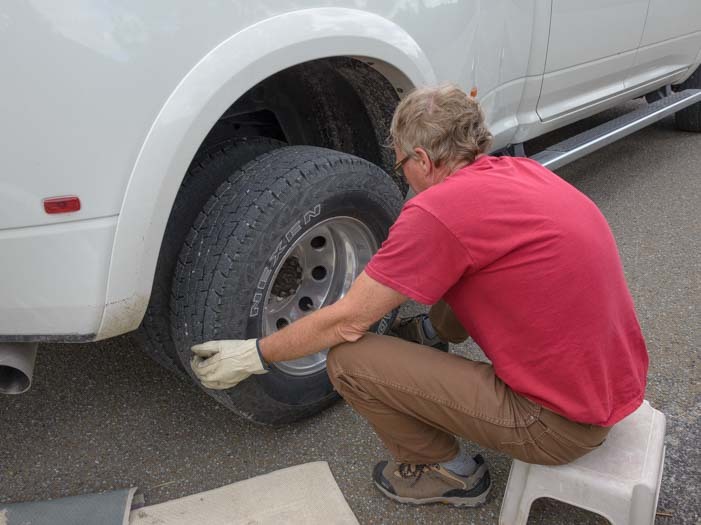 Each foot of the base required a little adjustment to fit properly into the truck’s pucks. 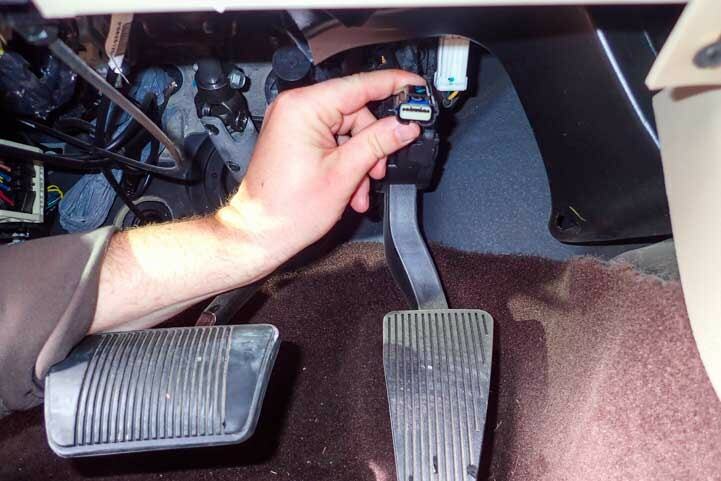 This was done by loosening and tightening the cap screws on the pilot assemblies on each foot. 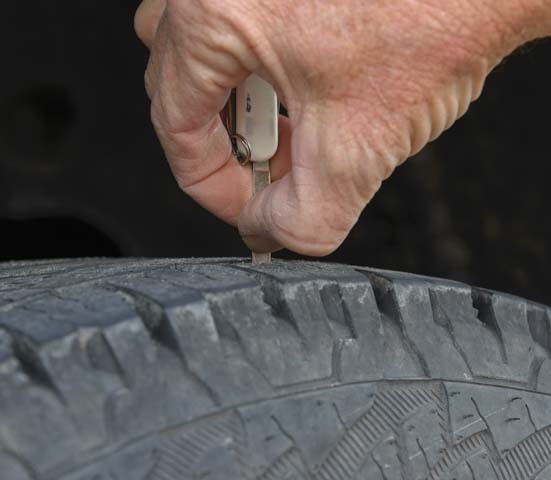 Each puck requires some small adjustments the first time. 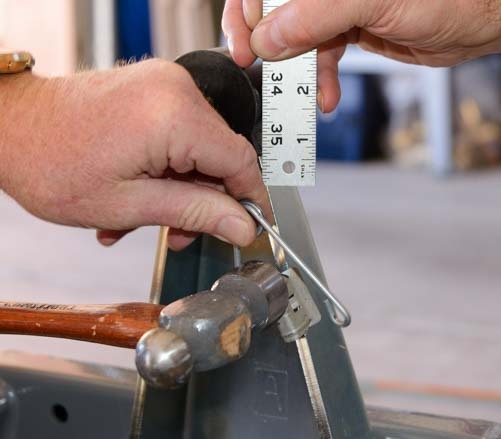 Then the tension in the latch handle was set by adjusting the height of the castle nut. 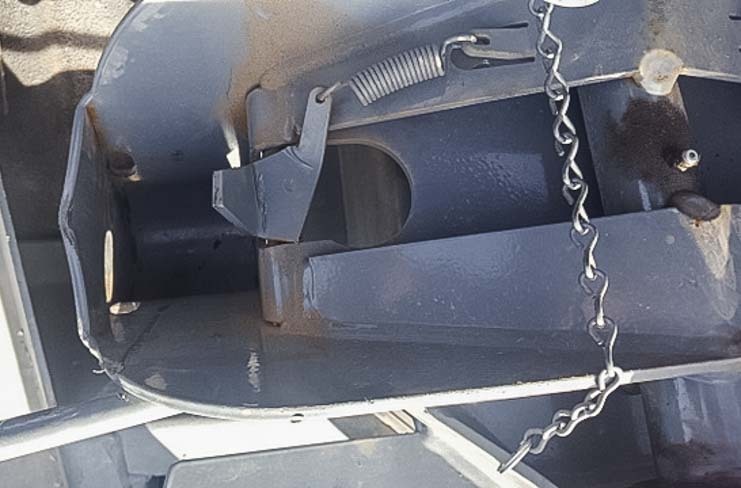 We used needle nose pliers to remove the cotter pin and then reinstall it and bend the end once the castle nut height adjustment was set. 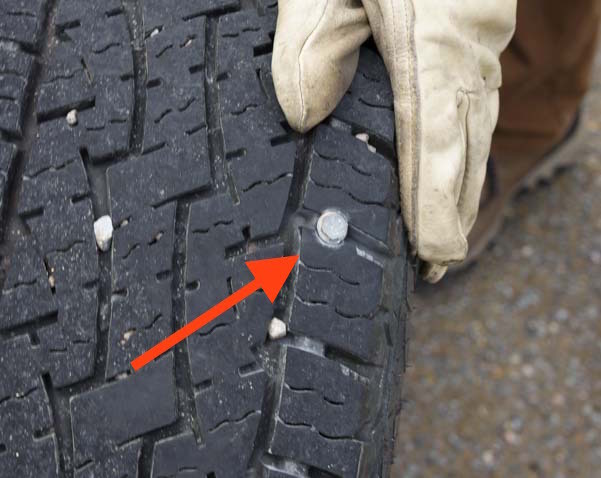 A sheer pin prevents the castle nut from backing out. It took a little pushing and shoving to get everything in place, but these are one-time adjustments. The latch handles could now be opened and closed easily. 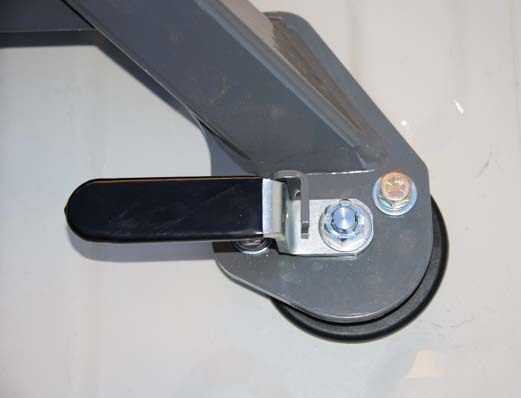 Hitch latch handle in the open position. 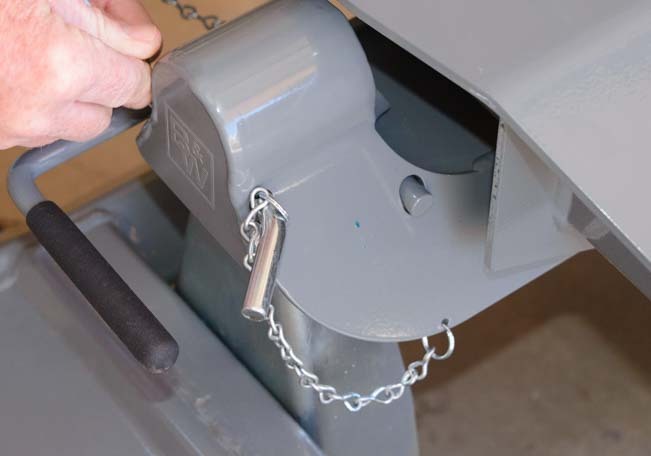 Hitch latch handle in the closed position. 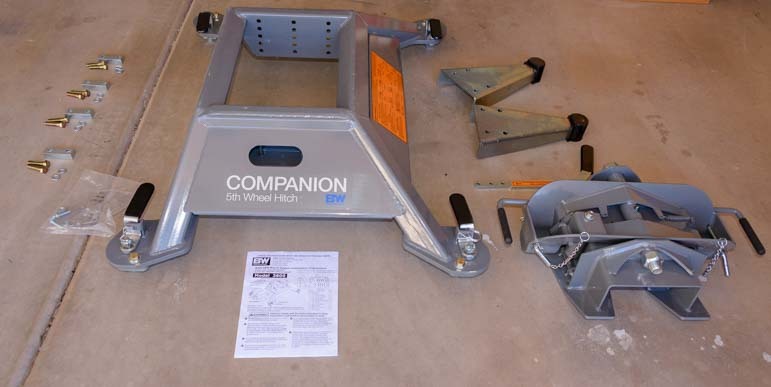 The B&W Companion hitch base was now installed in the bed of the truck. 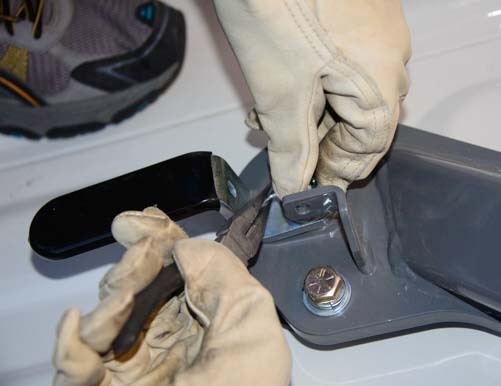 The base is installed and all four latch handles have been adjusted to open and close easily. 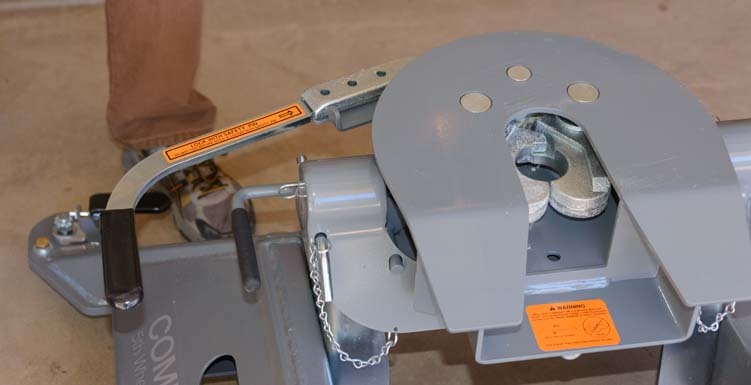 Next, the hitch head (the “coupler”) was set on the hitch base. 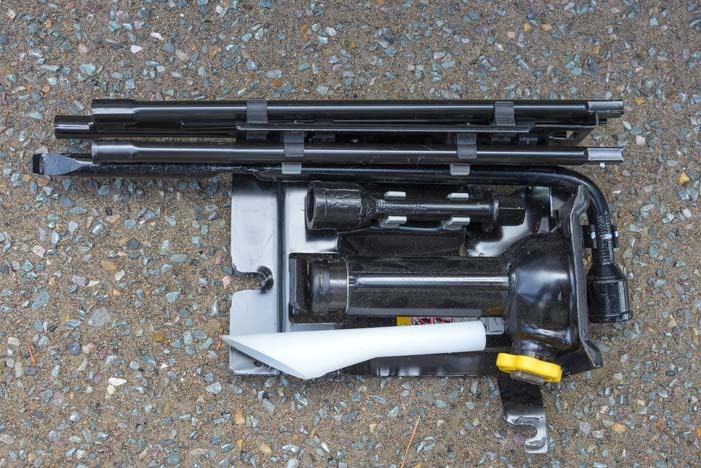 The two saddle handles were pushed down and the saddle lock pin was put in place. 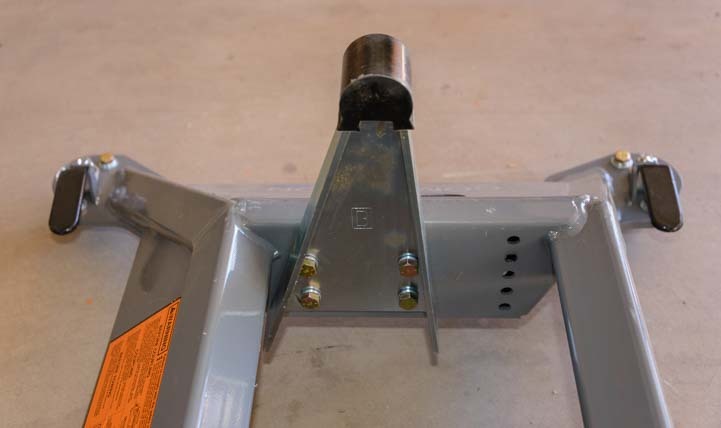 The coupler is placed on top of the hitch base. Ta da!! 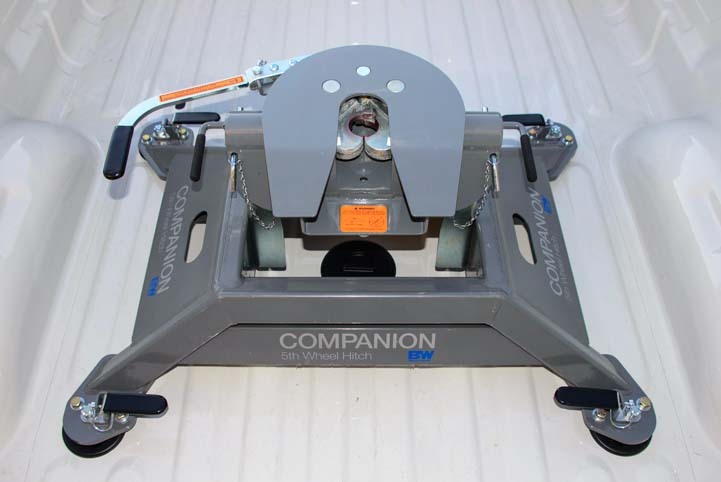 The B&W Companion OEM 5th Wheel Hitch is installed in the truck and ready for use. 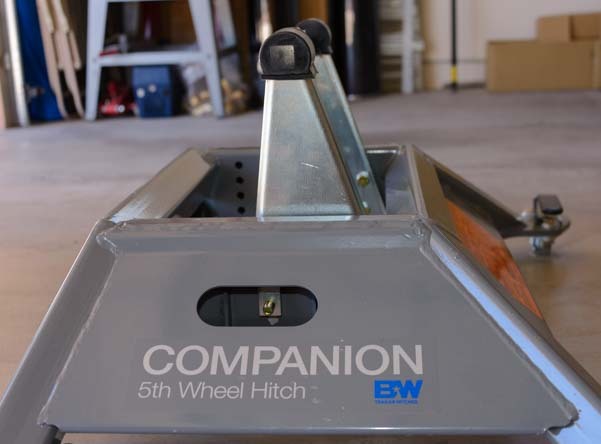 The B&W Companion OEM 5th wheel hitch is completely installed! 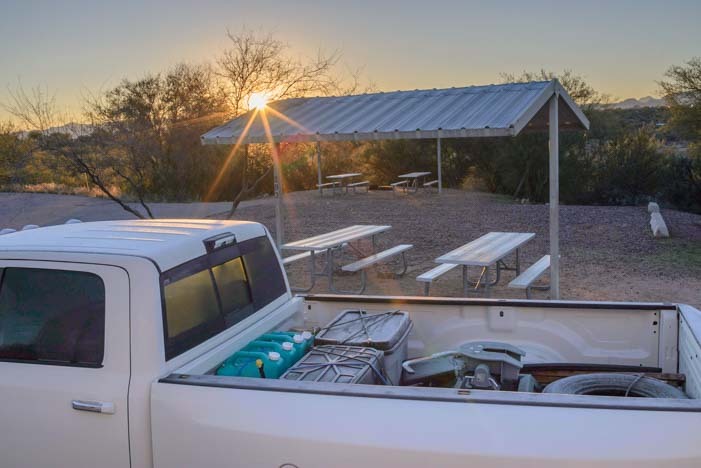 This view (above photo) is looking towards the tailgate. 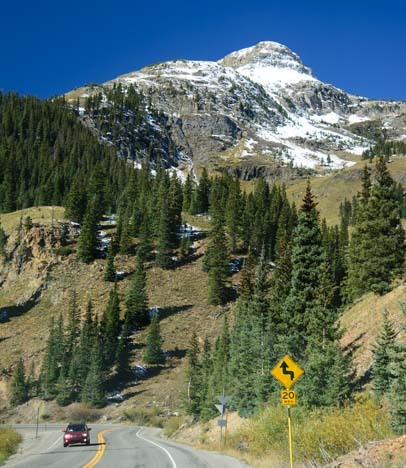 This view is looking towards the truck cab. Hey, can I have a beer too? 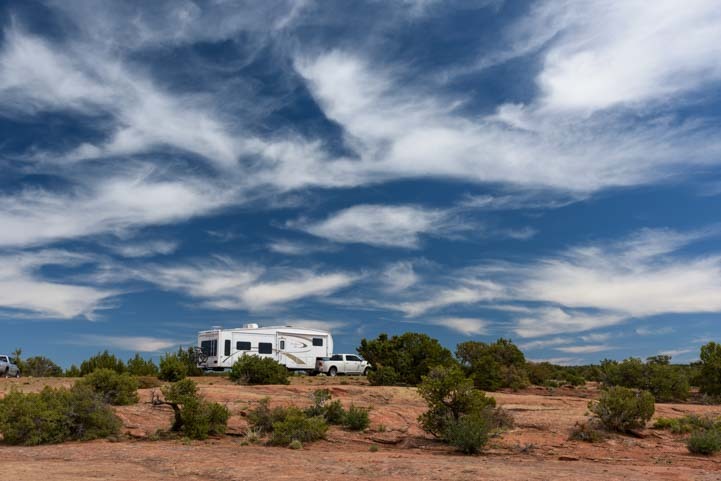 Celebrations behind us, the next day we hitched the new truck up to our fifth wheel trailer and took our home on a joy ride up and down some nice long 7% grades nearby. What a combo!!! Prior to hitching the truck to the trailer the first time, we cleaned the hitch plate on the trailer and lubed both that and the coupler plate on the B&W hitch with CRC silicone spray. 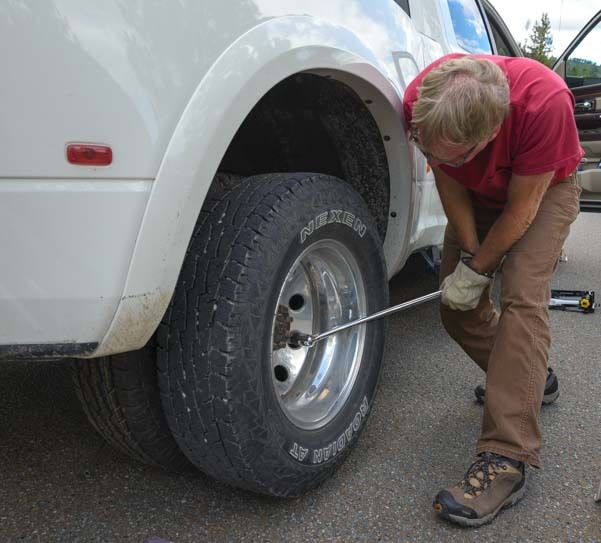 We ended up adjusting the pivot arms down one notch, and that seems right for our particular truck and trailer. 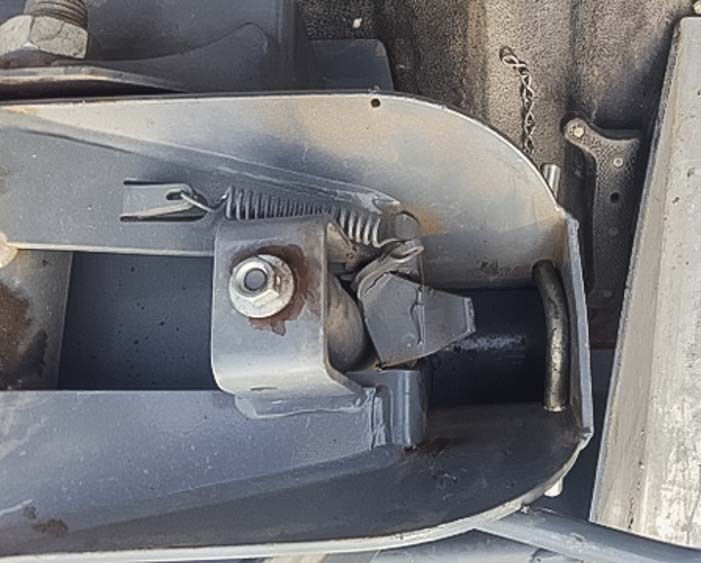 We adjusted the height of the pivot pins by one notch to get the distance between the sides of the truck and the fifth wheel overhang right. 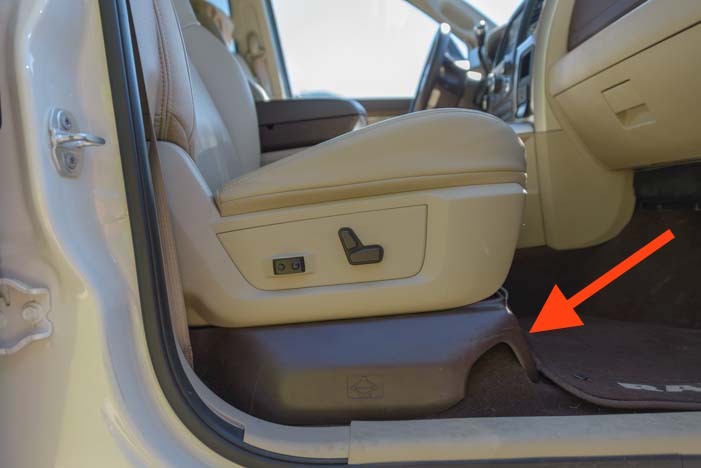 The following info is FYI for those whose truck does not have a Puck System in the bed. 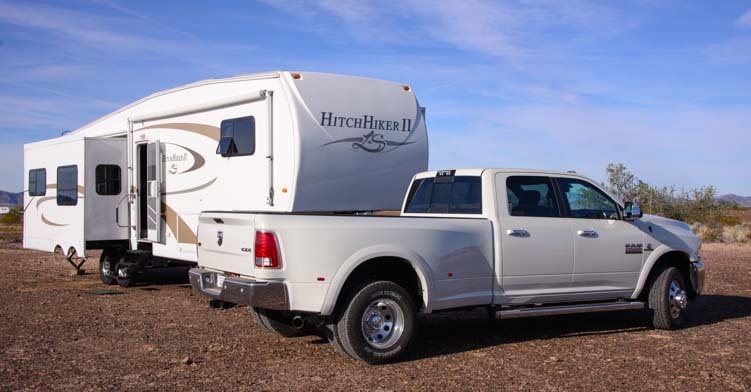 The Gooseneck Turnover Ball hitch is one option which allows you to have a totally flat truck bed when the hitch is removed. 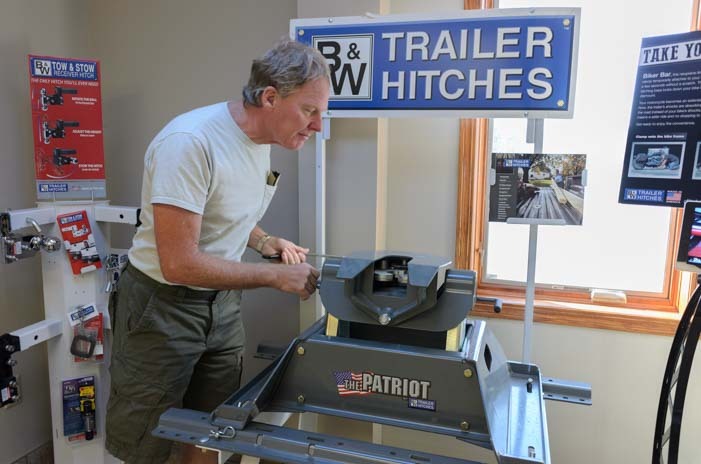 The other option is to go with the traditional rail mounted Patriot fifth wheel hitch. 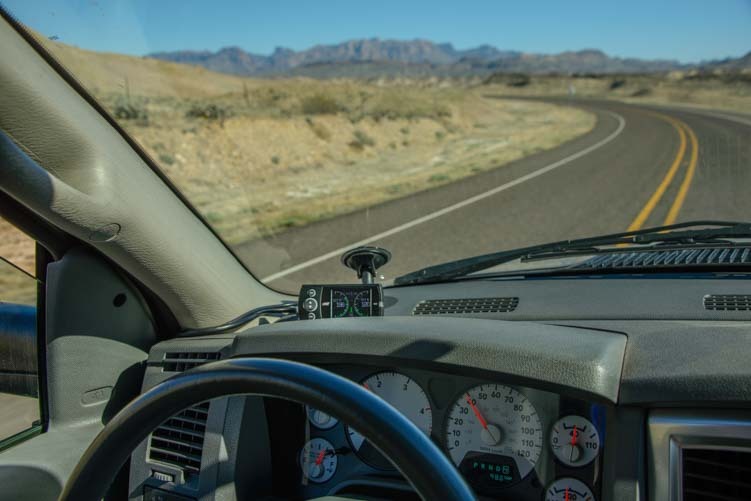 Unlike the Puck System hitches, the Gooseneck Turnover Ball hitches require installing the Gooseneck Turnover Ball in the bed of the truck with rails mounted underneath. 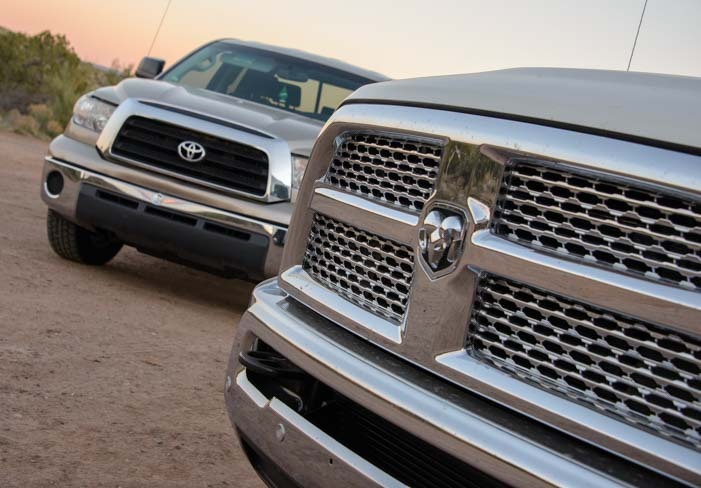 So, each truck bed in each model year has a different kit. 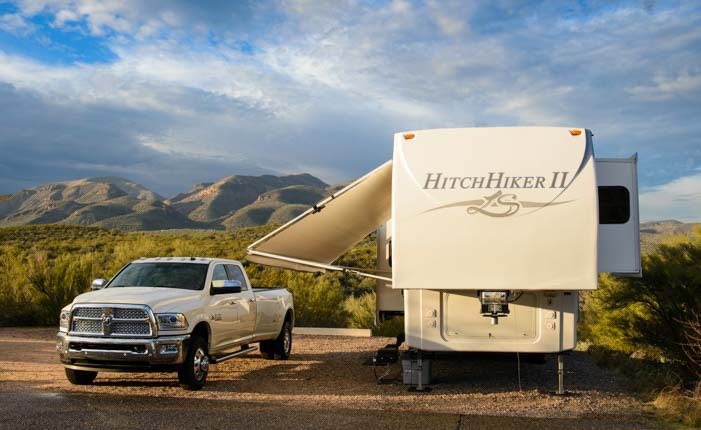 The B&W Companion Hitch that mounts onto the Gooseneck Turnover Ball in the bed of the truck comes in two flavors: long bed and short bed (slider hitch). Don’t see your truck? Check here. 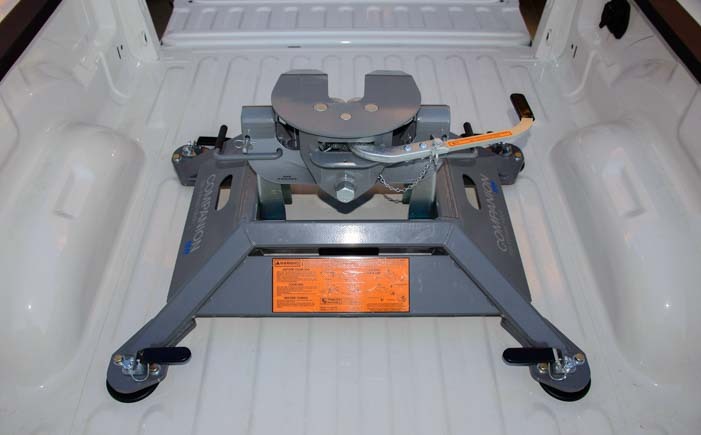 B&W Fifth Wheel Hitches – The full line-up of fifth wheel hitches from B&W. 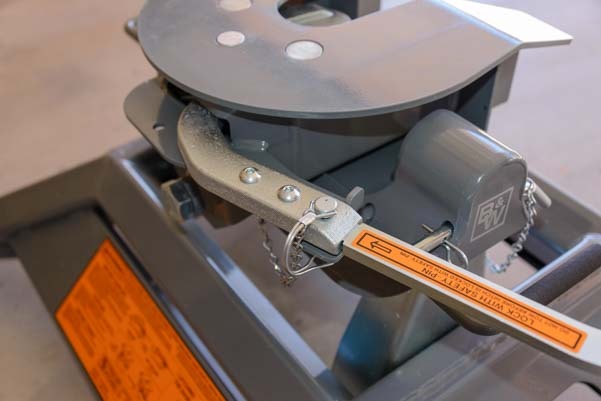 Official Specs for Our Hitch – The B&W Companion OEM fifth wheel hitch for Ram trucks. 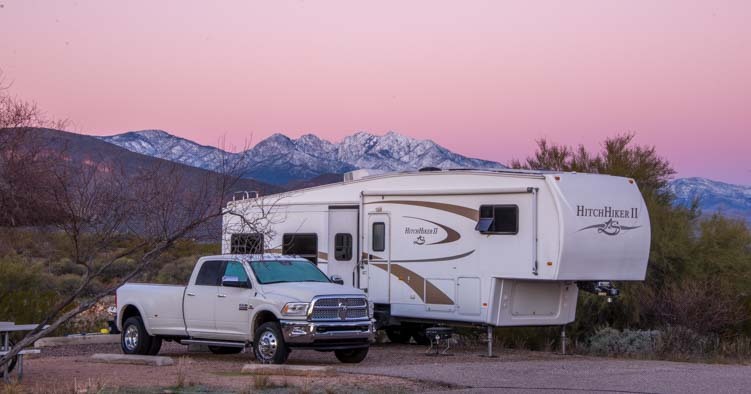 Where to buy a B&W Companion OEM Fifth Wheel Hitch for Dodge Ram trucks – Great price! 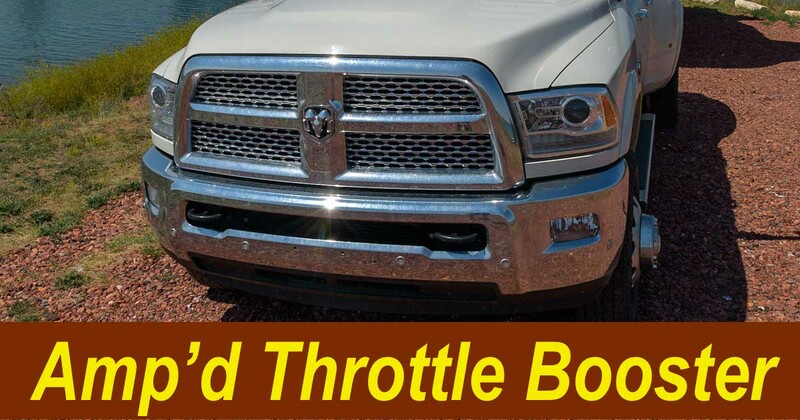 Dodge Ram 3500 Dually Truck – Best RV Fifth Wheel Towing – Why we bought the truck we did. 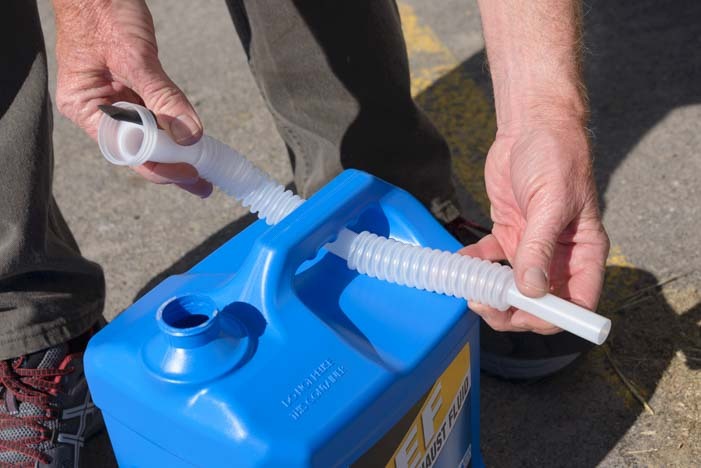 How to Put DEF (Diesel Exhaust Fluid) in a Truck and Which Brand is Cheapest? 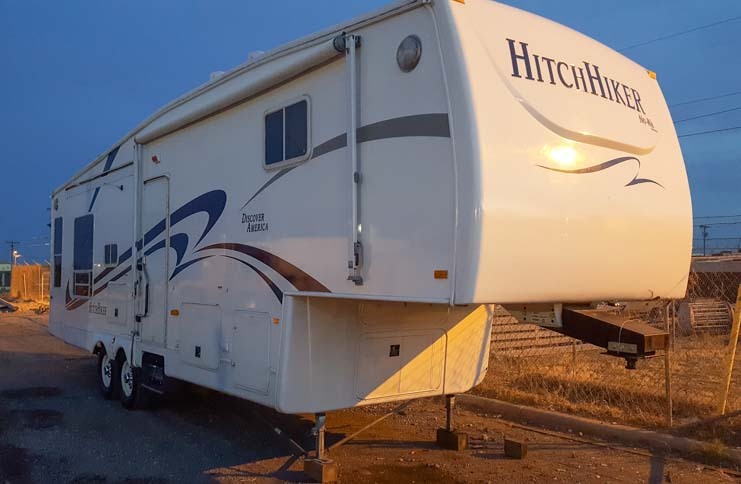 to our NuWa Hitchhiker fifth wheel trailer.